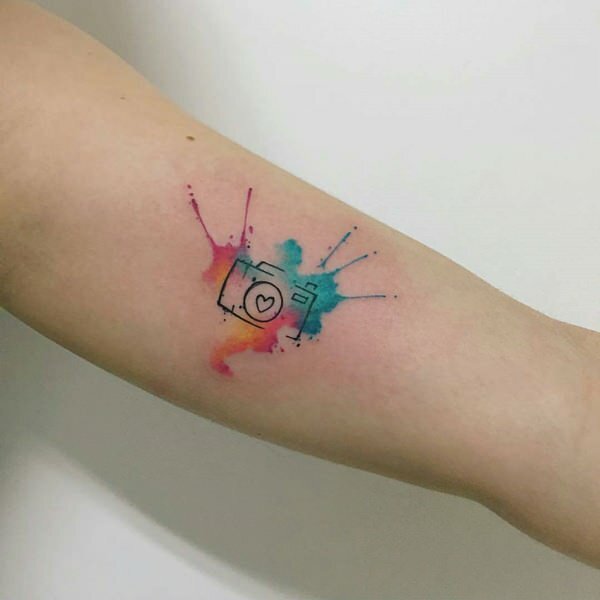 Watercolor tattoos have recently become extremely popular amongst tattoo enthusiasts, and in-turn this means that there are naturally many questions that are regularly asked about them. 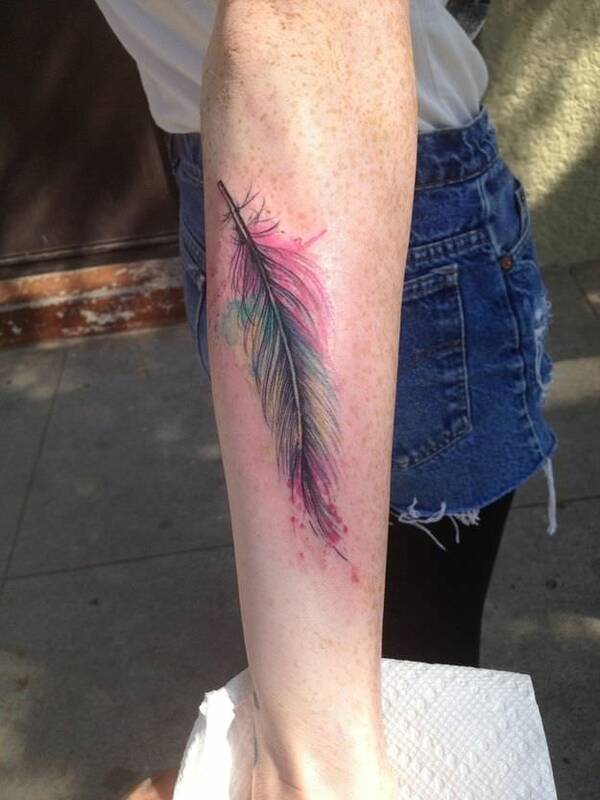 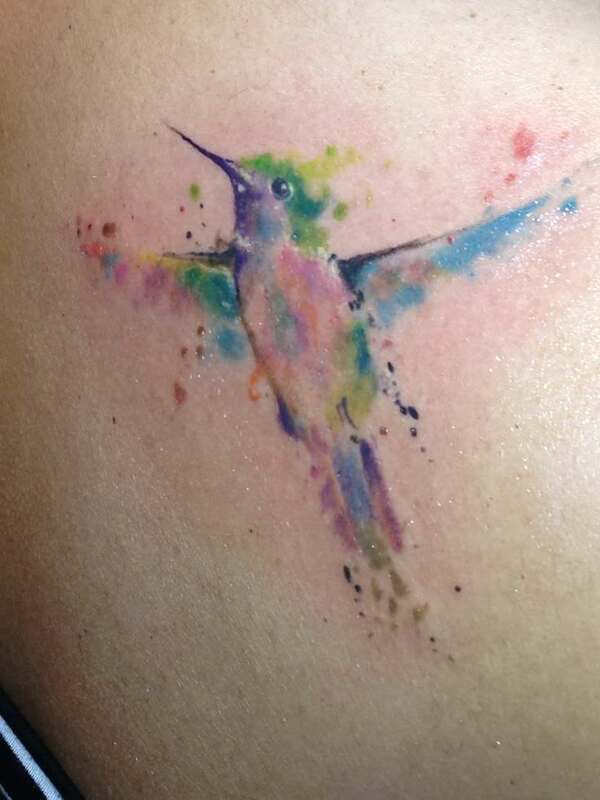 One of the main ones that everybody is interested about is how quickly watercolor tattoos fade. 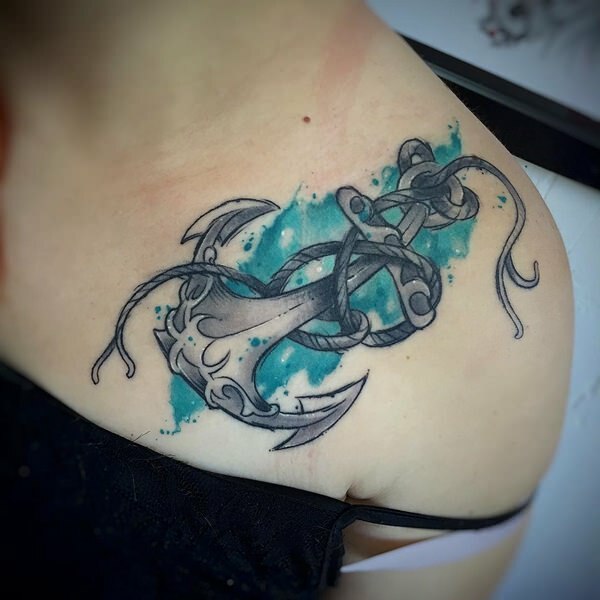 There are many skeptics who believe that tattoos should never be done in a watercolor style as they are not robust enough to stand the test of time - but it isn’t as simple as that. 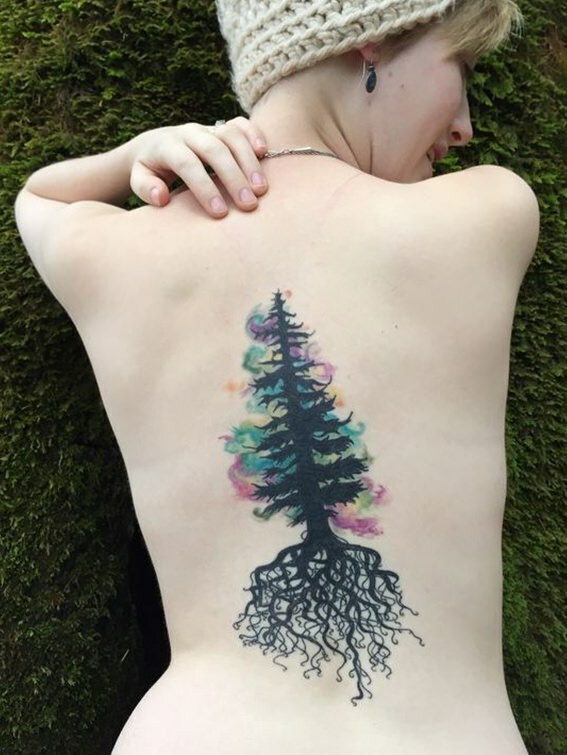 Hopefully this article can help to shed some light on this argument and help to show you exactly what watercolor tattoos are, and how they are made. 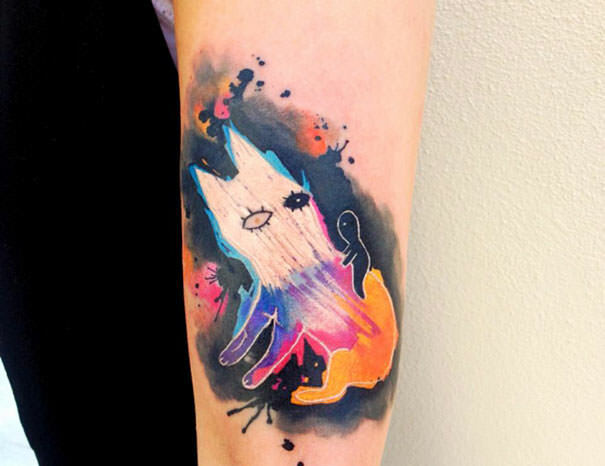 How Fast Should Watercolor Tattoos Fade? 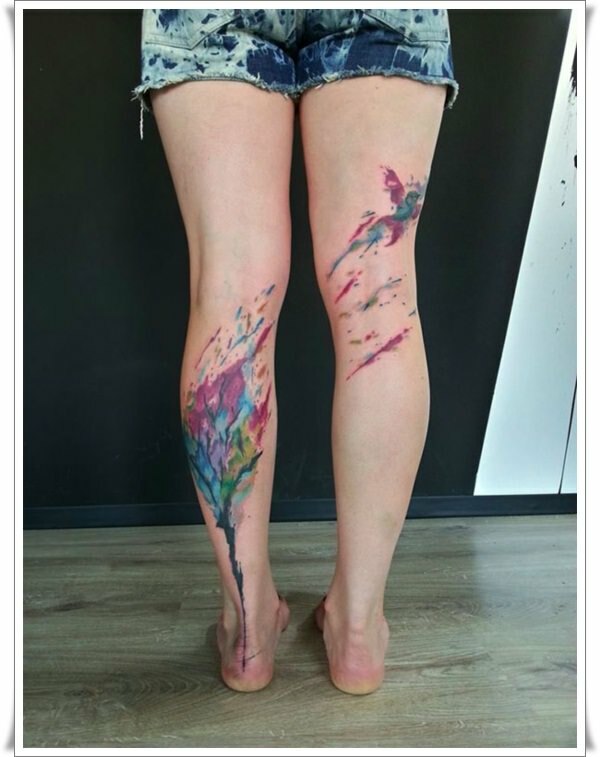 And What Can Cause Them To Fade Quicker? 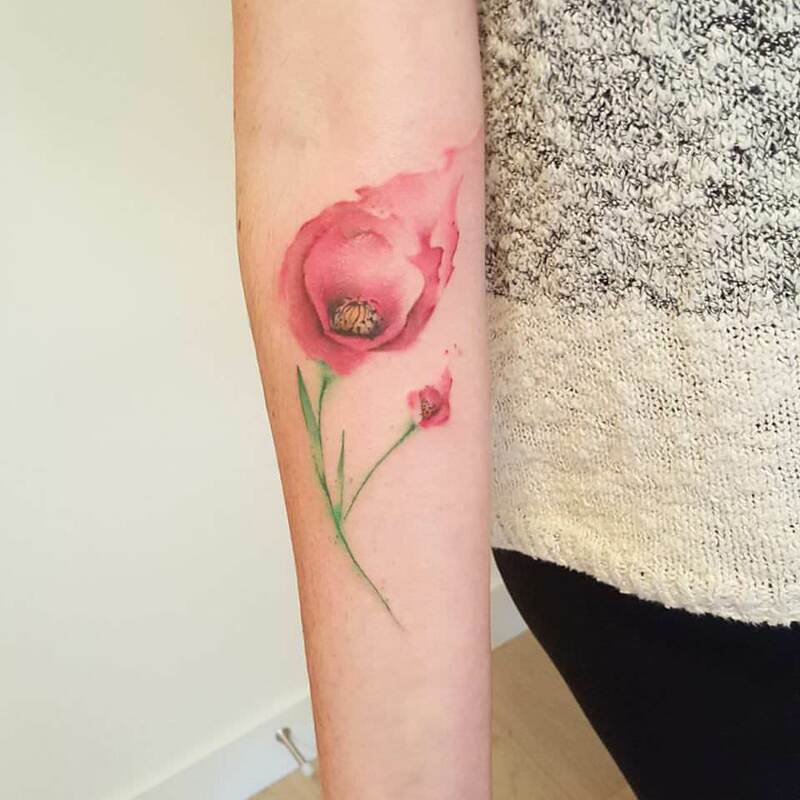 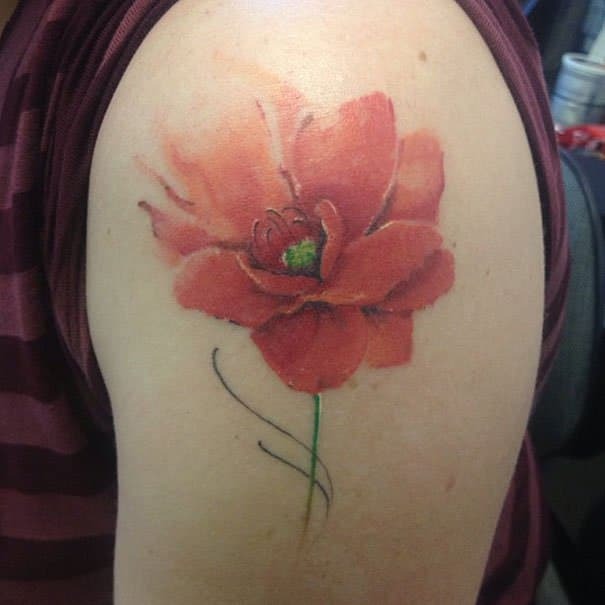 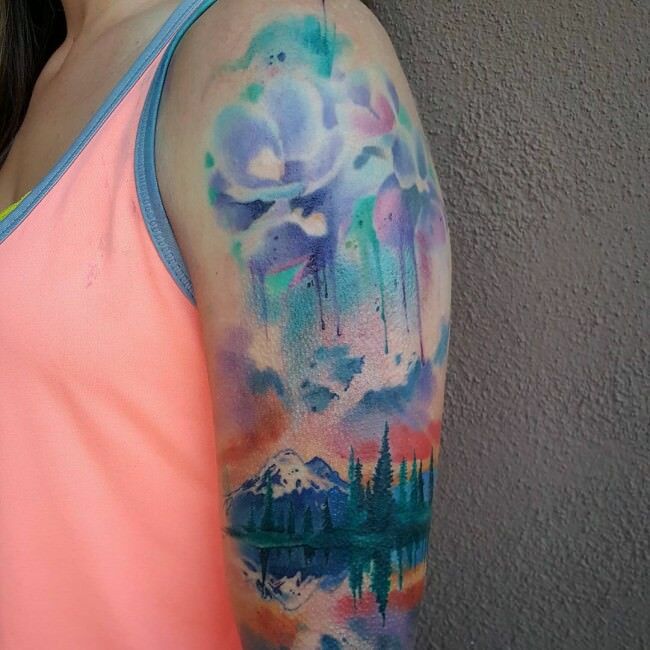 What Can You Do To Stop A Watercolor Tattoo From Fading So Quickly? 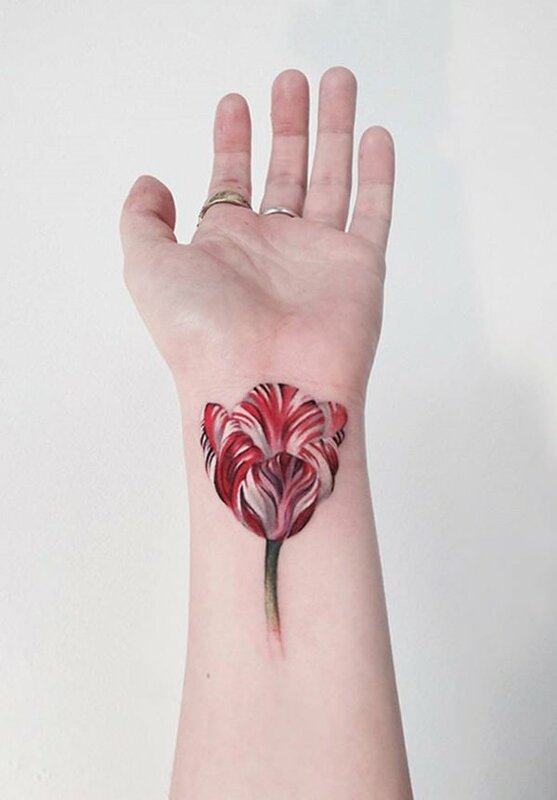 Although many people think that watercolor tattoos are created completely differently from ‘normal’ tattoos, and that they require a whole different tattooing setup - this is false. 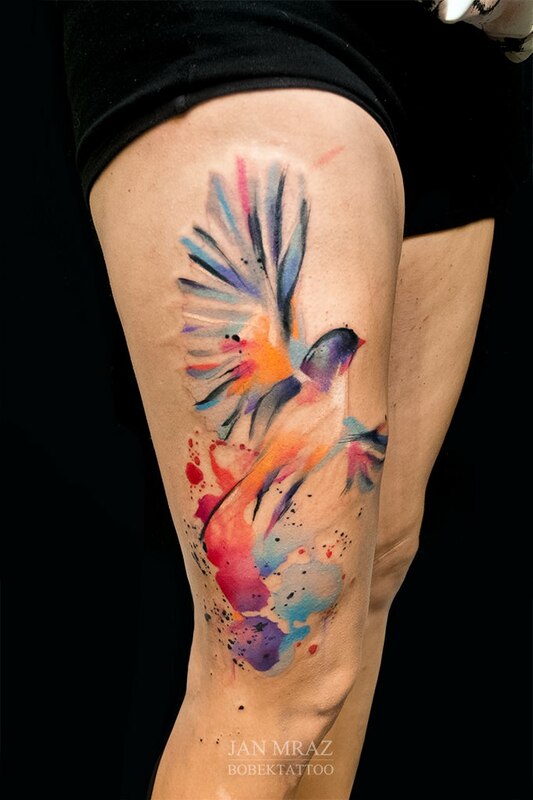 Watercolor tattoos are created in the same way, using the same tools as regular tattoos, with the only differences being the styles and techniques of shading and coloring that are involved in the creation of these tattoos. 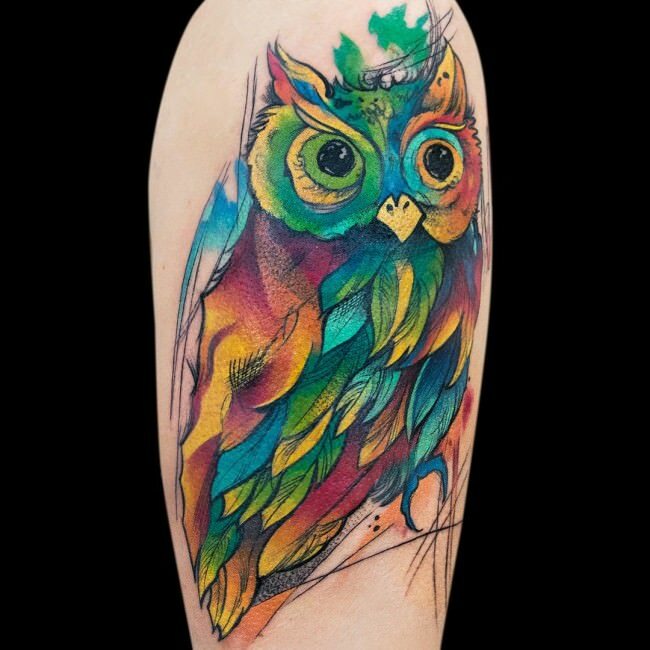 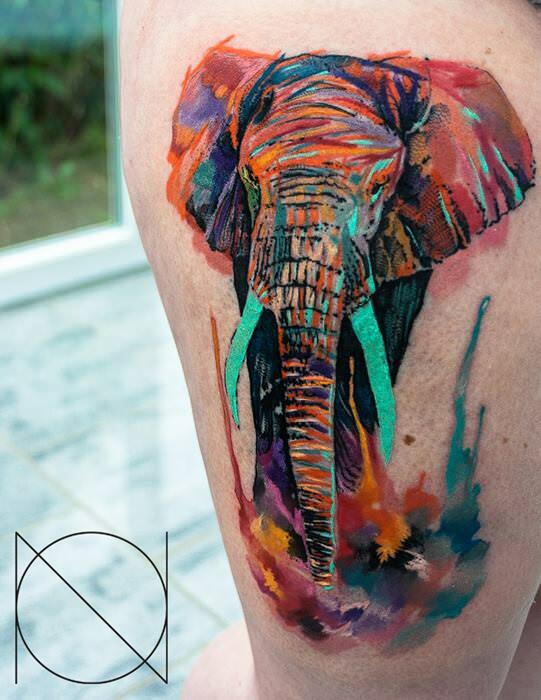 Whilst traditional tattoos are generally made up of many areas of solid colors that are all merged together to form one larger image; watercolor tattoos are created with much more gradual coloring. 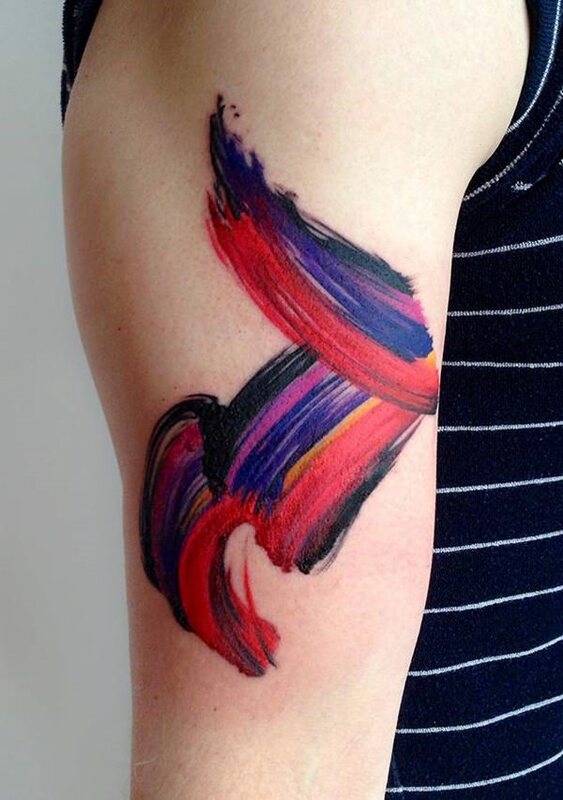 These subtle gradients where the merging of colors is much less pronounced helps to create the desired look, which is usually to resemble the characteristics of a classic watercolor painting. 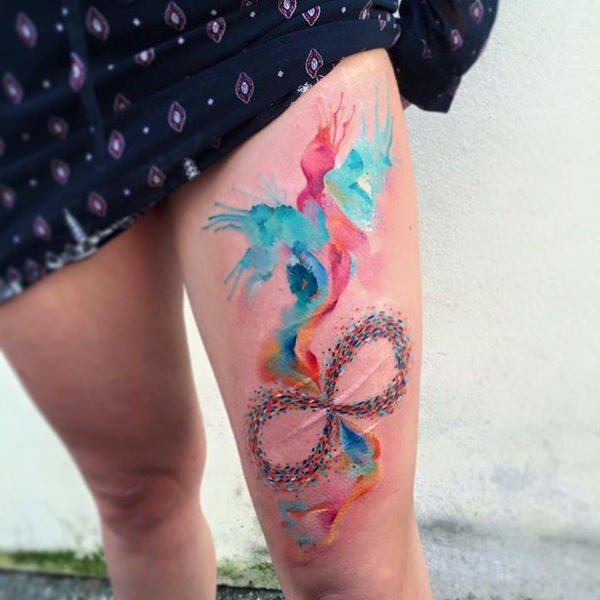 Another noticeable difference is that a large majority of traditional tattoos contain solid outlines/borders, whereas nearly all watercolor tattoos have no outline, although there are many artist that creatively merge traditional styles with watercolor concepts in order to produce a mashup of designs within a single tattoo. 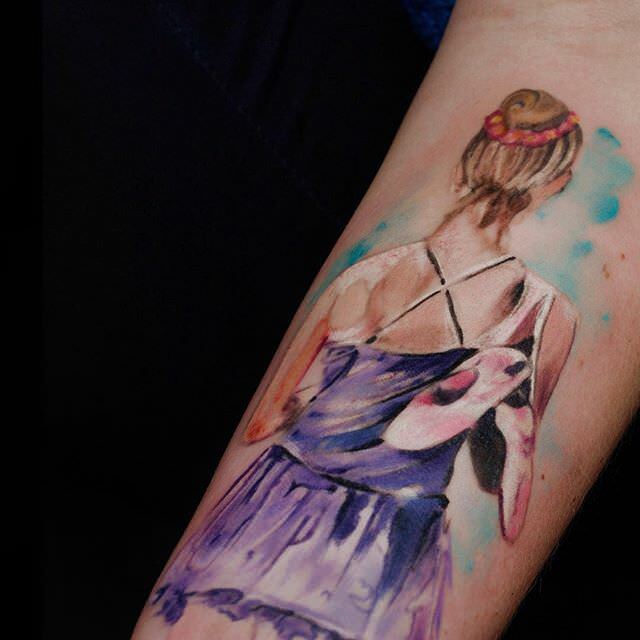 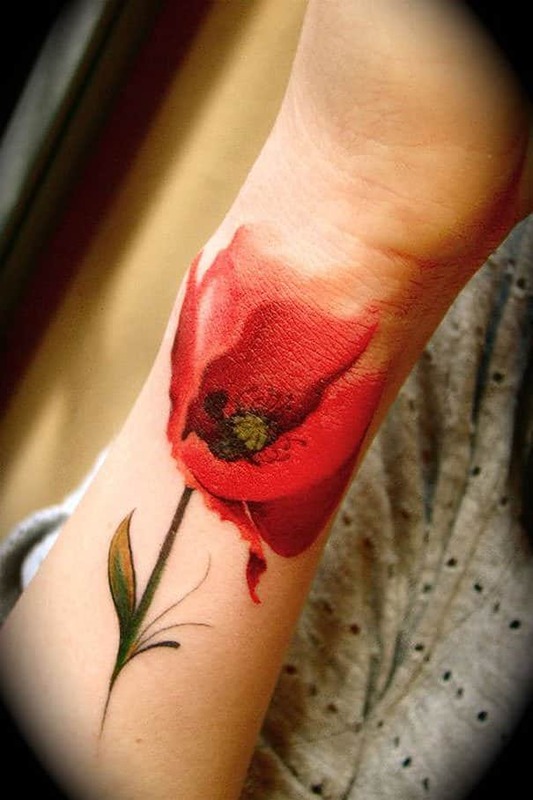 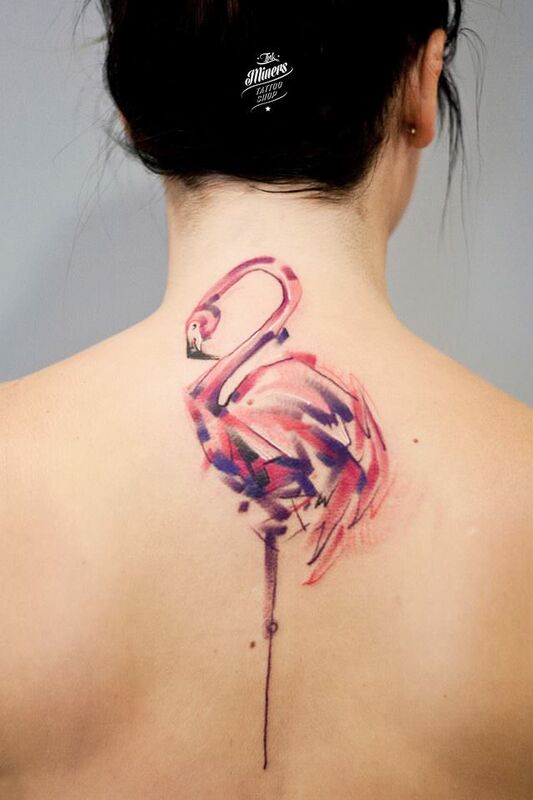 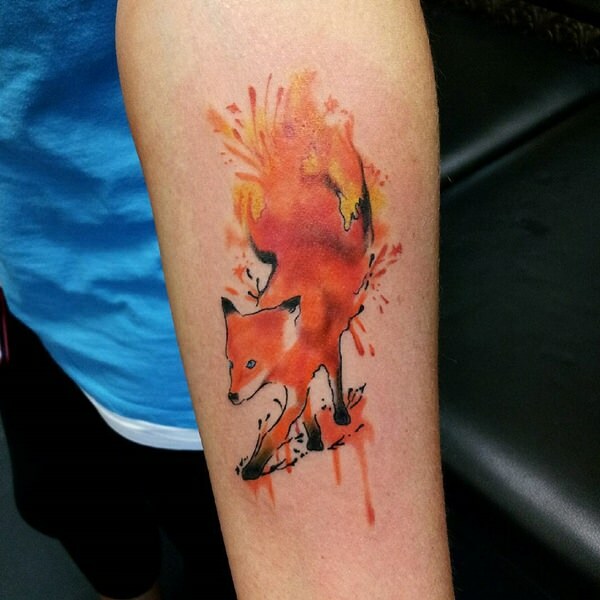 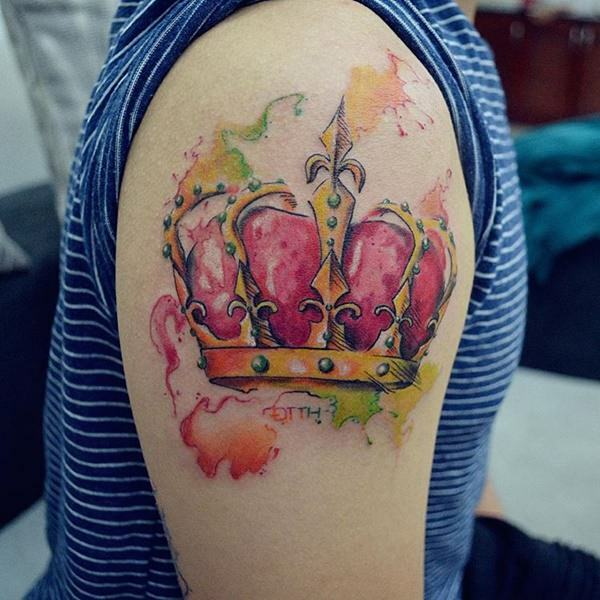 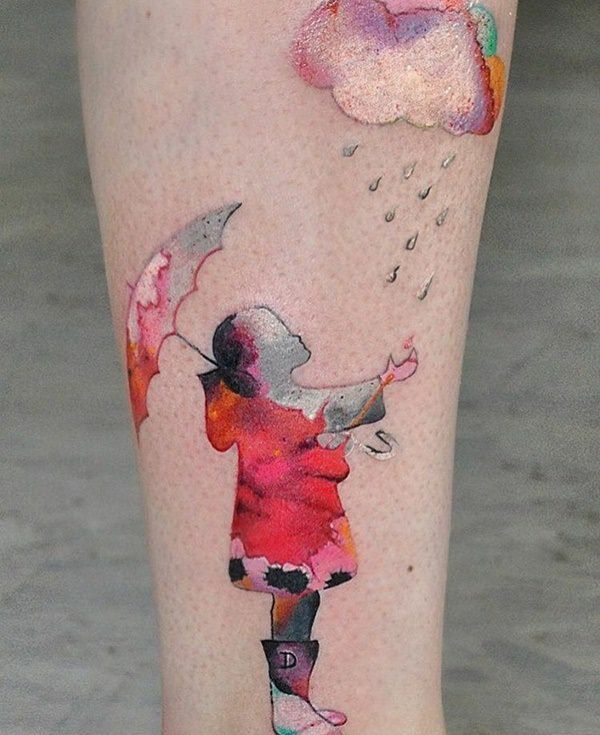 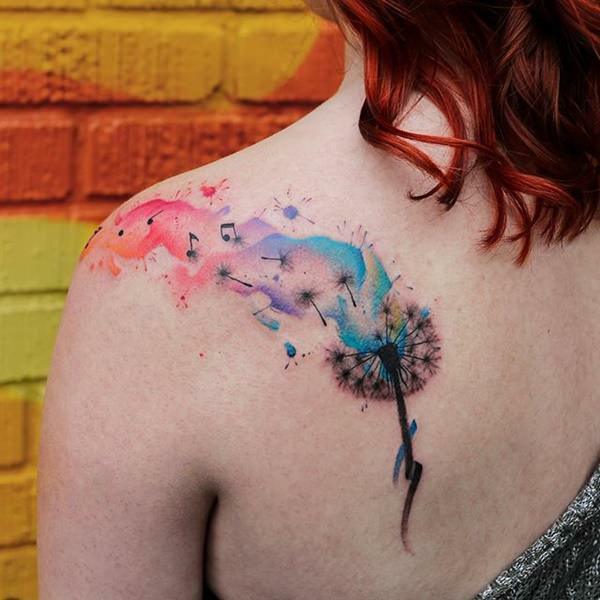 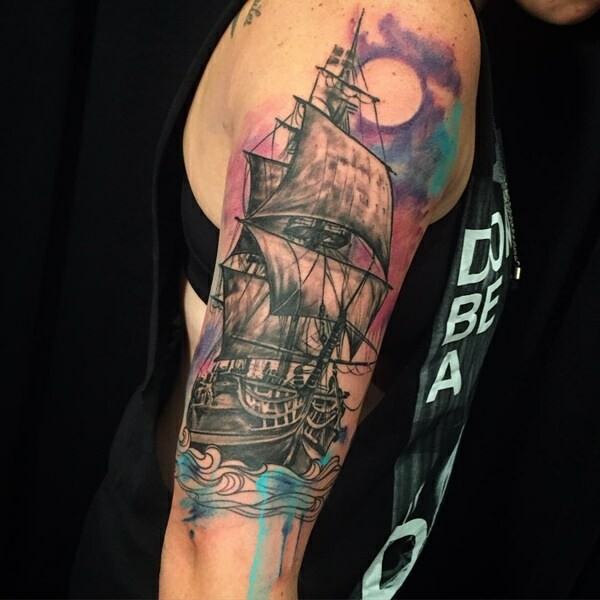 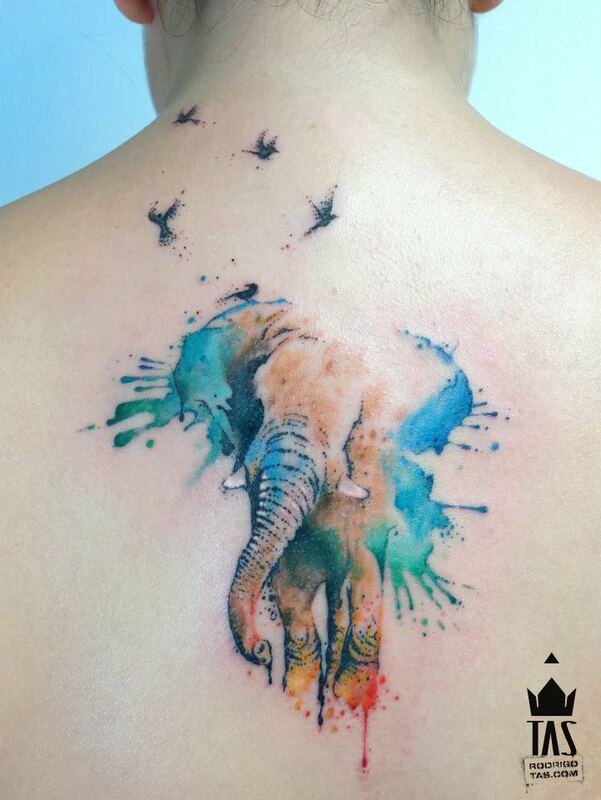 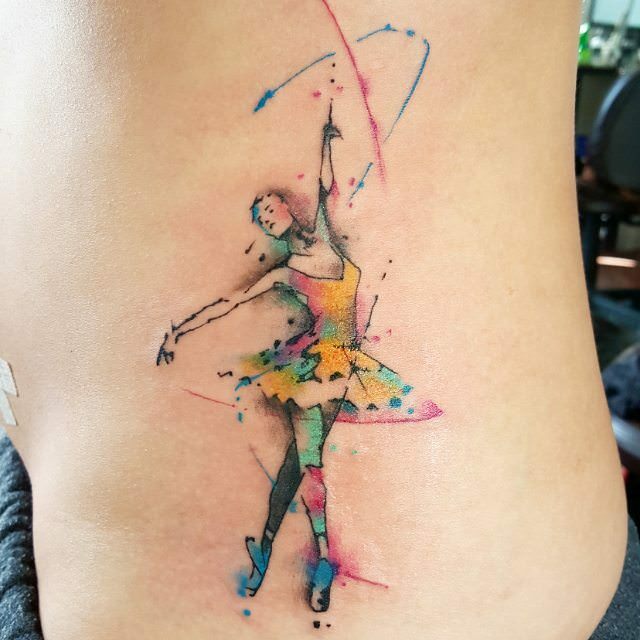 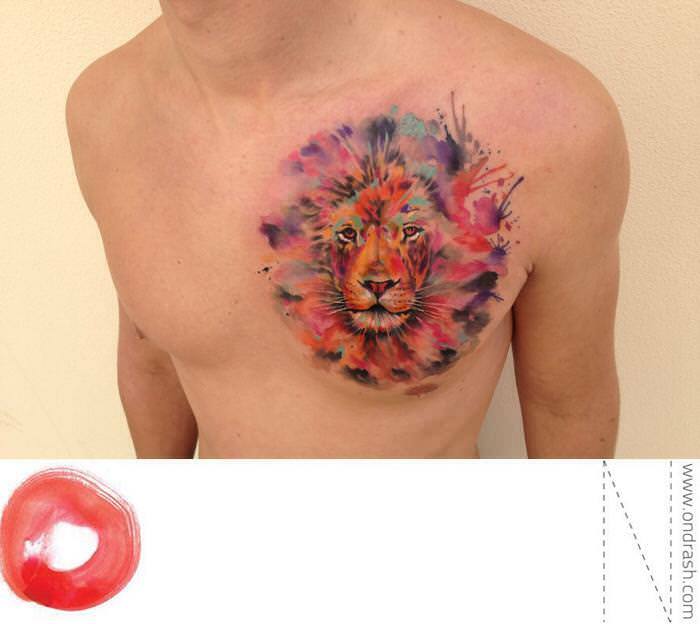 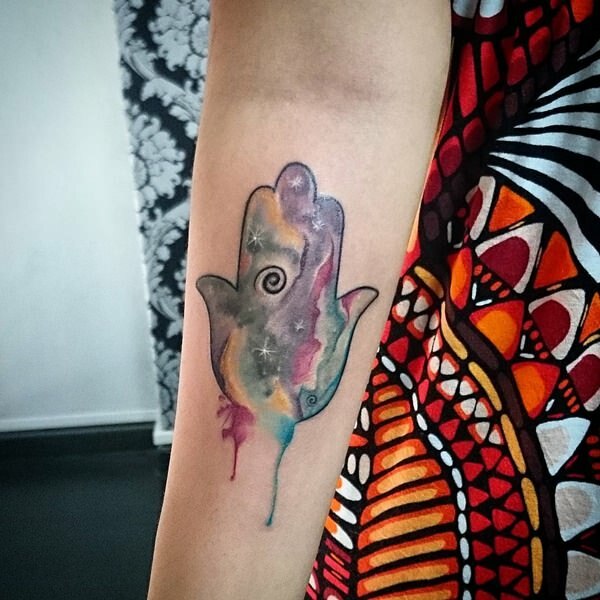 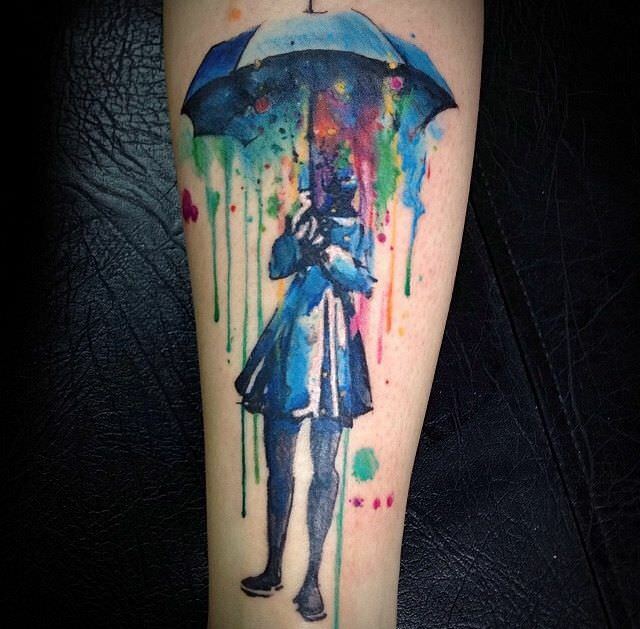 Common themes seen within many popular watercolor tattoos range from designs of paint splatters right through to full-blown duplicates of watercolor paintings. 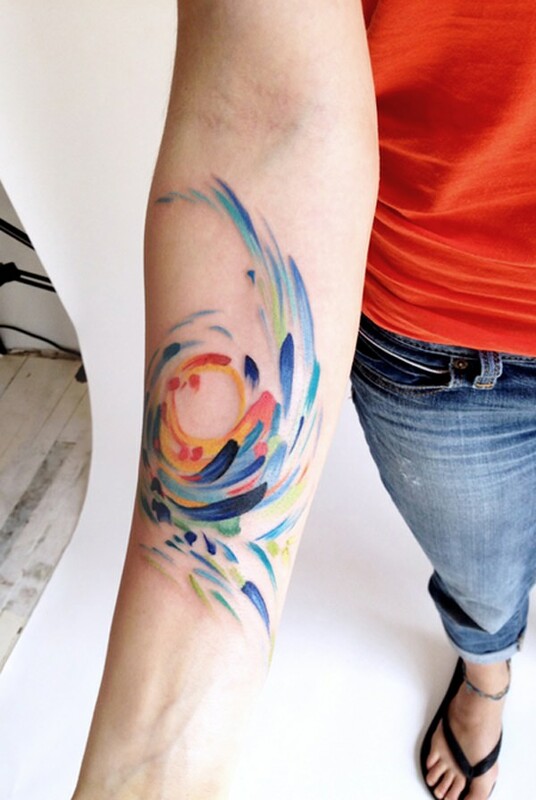 In order to create these various concepts, many techniques are adopted by the artist. 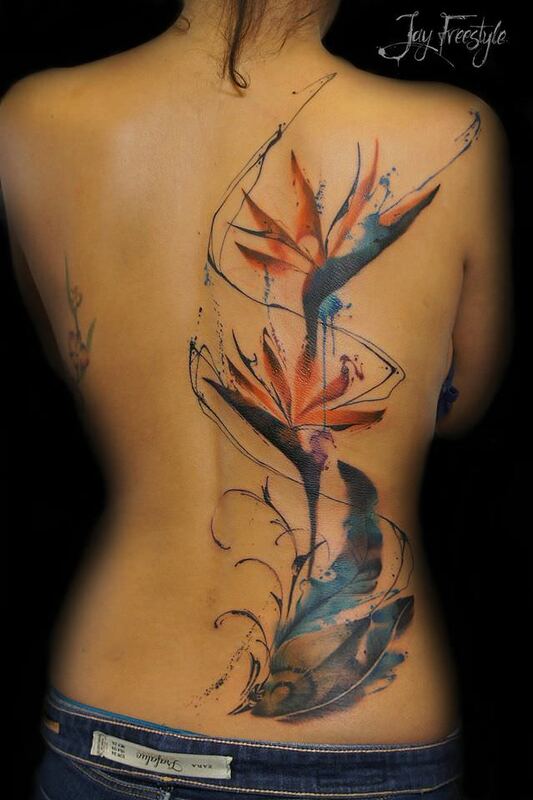 Some are relatively easy to learn for an individual, whilst some can take years of experience to master. 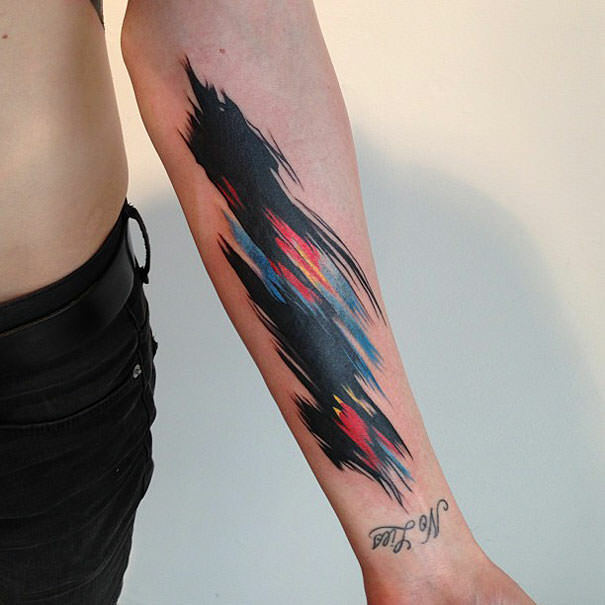 These varying techniques include blurs, bleeds, fades, shades and runs. 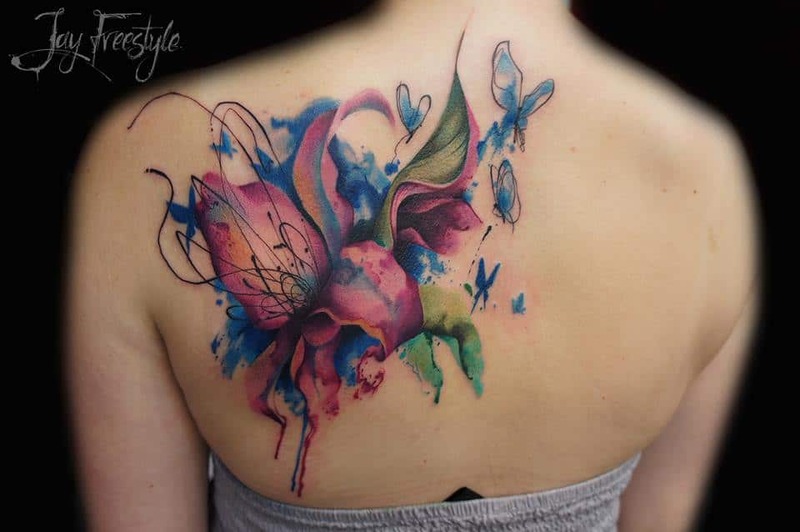 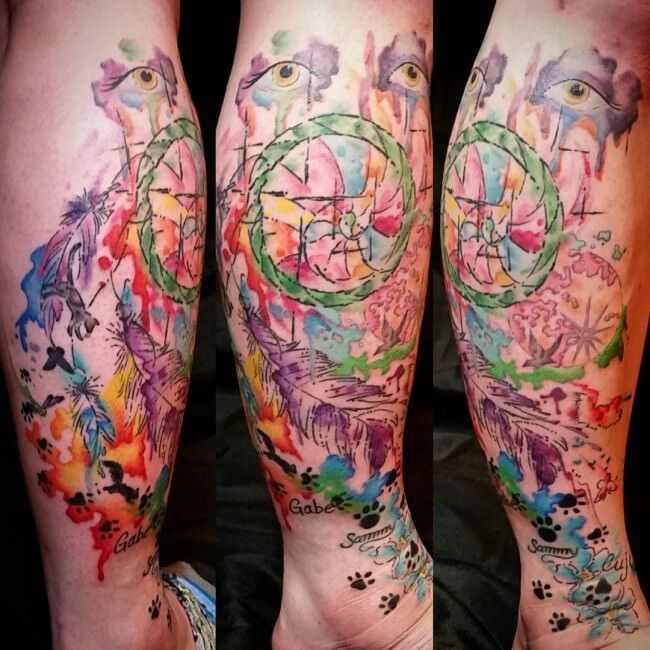 Many watercolor tattoo critics argue that these types of tattoos will not look good for very long as they begin to age due to being primarily made up of very soft colors, which also generally tend to lack any great amounts of contrast. 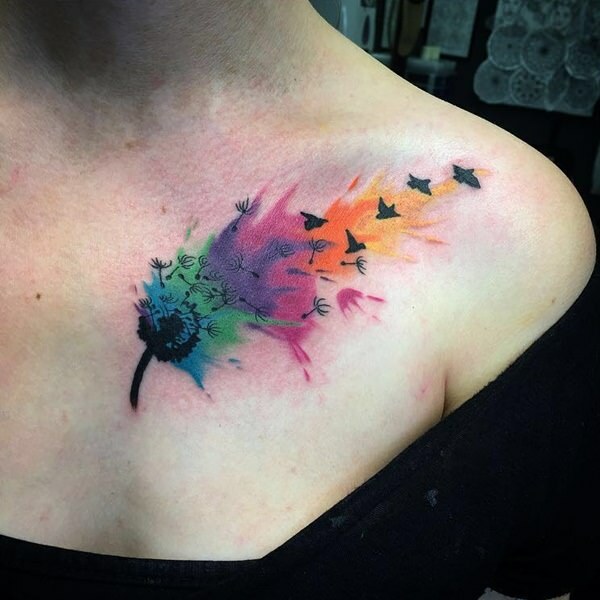 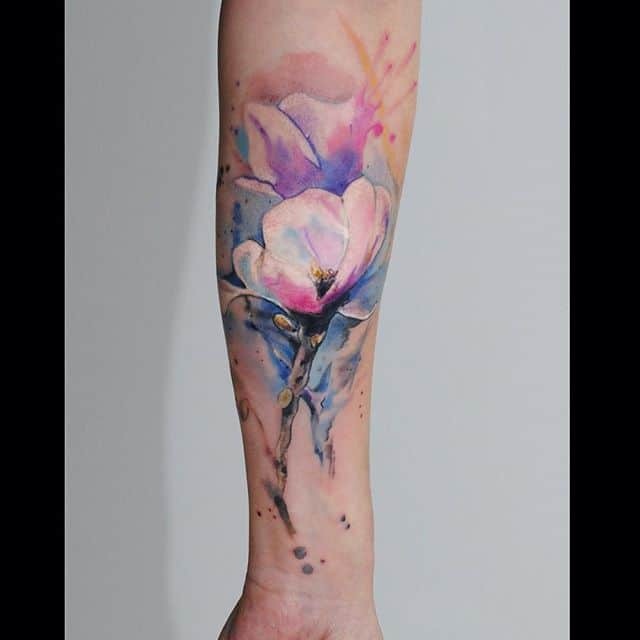 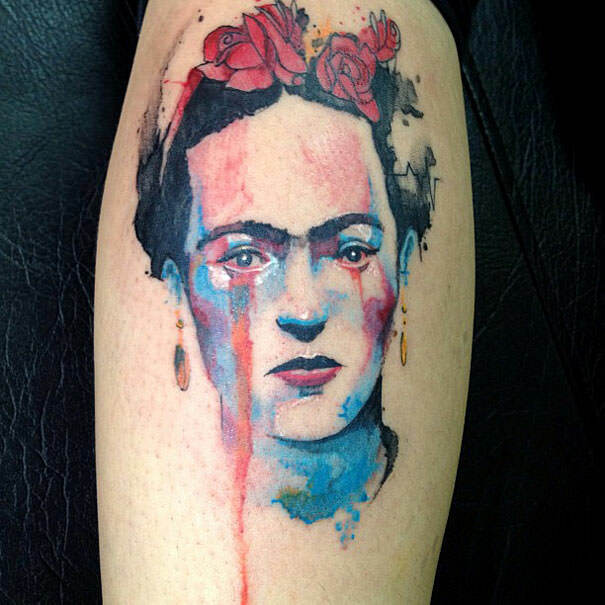 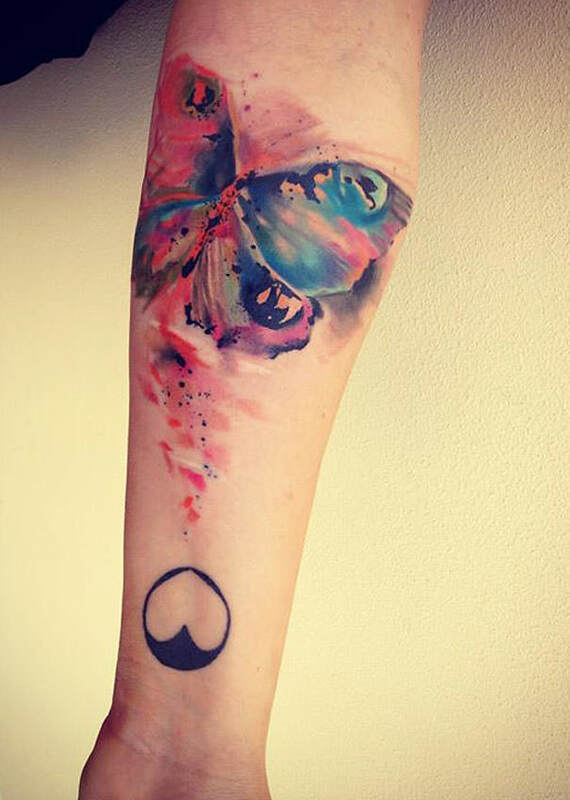 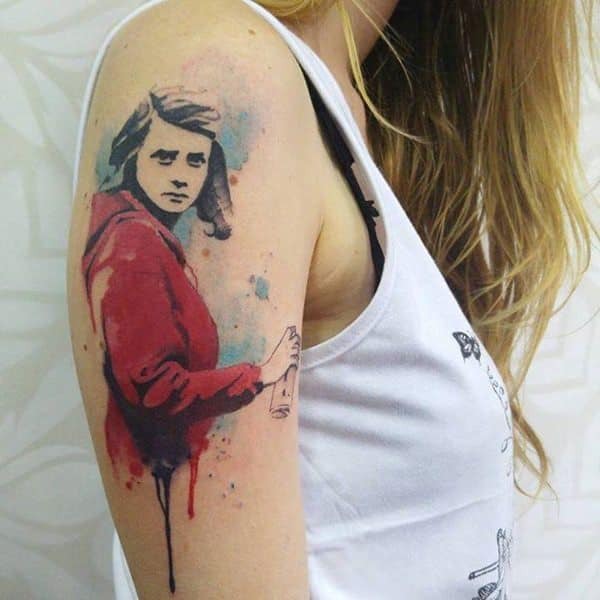 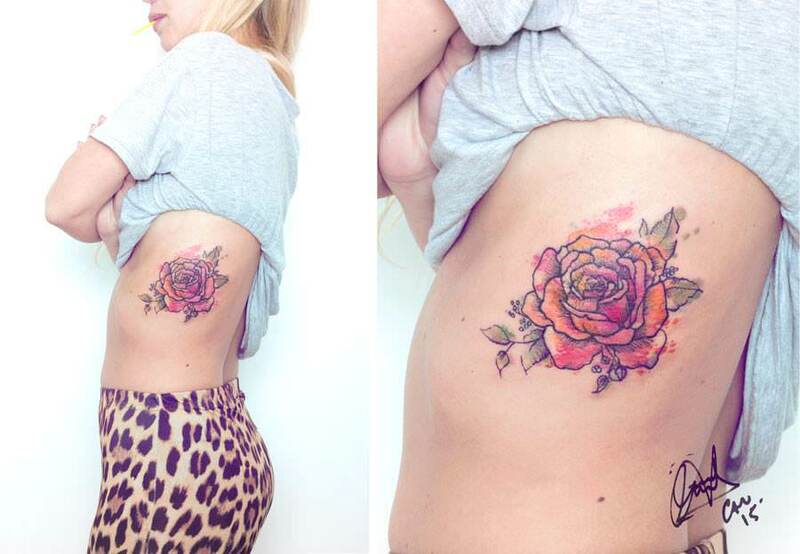 Whilst this is true, and lighter colors do tend to fade quicker than darker colors and blacks, a good artist who is experienced in creating watercolor tattoos should be able to greatly reduce the chance of watercolor tattoos becoming unrecognizable as they age by applying a good black base layer, and by creating much more depth in contrast. 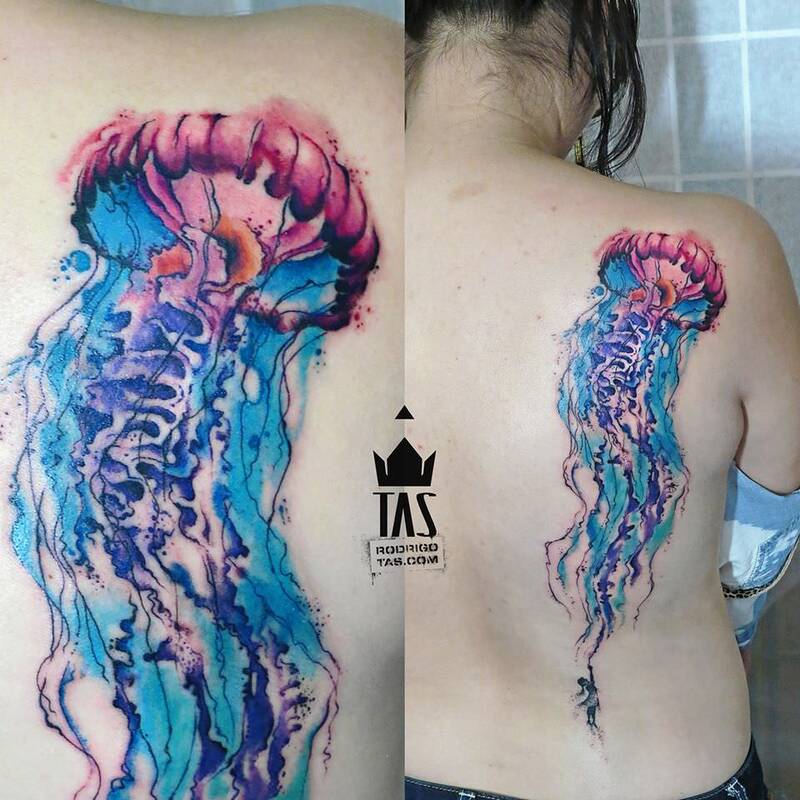 These precautionary steps taken by the artist will enable the tattoo to still hold onto its ‘skeleton’, even if the lighter colors do begin to fade. 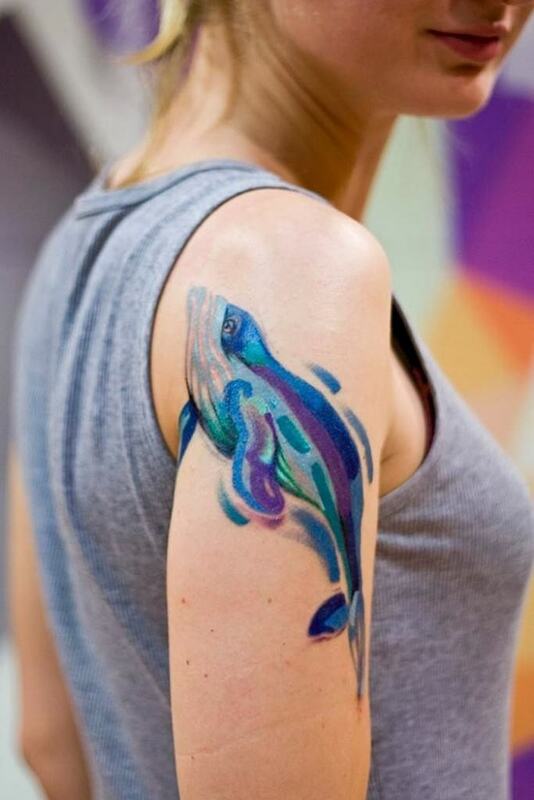 This means that it will still look much more like a tattoo and a lot less like a blurry patch of faded ink if it does begin to fade at all - and it will also be much easier to touch-up by an artist should you wish to give it another boost of life and vibrancy. 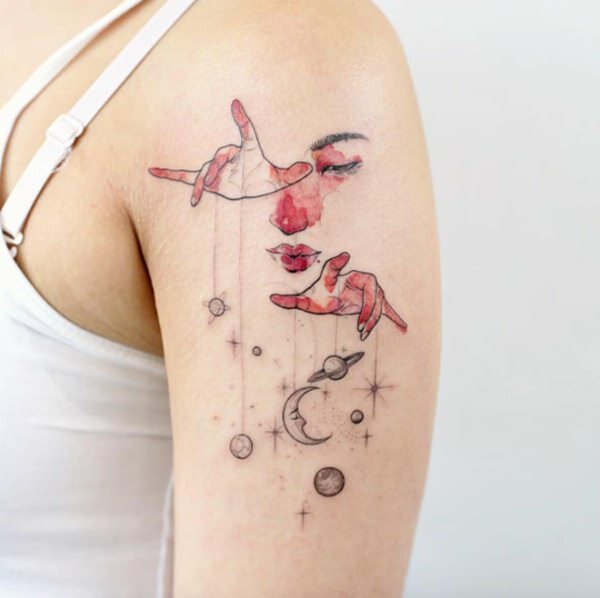 Another argument is that this style of tattooing is still relatively new, and therefore it hasn’t been around for long enough to determine how older, more aged watercolor tattoos will eventually turn out in 10/15/20/30 years time. 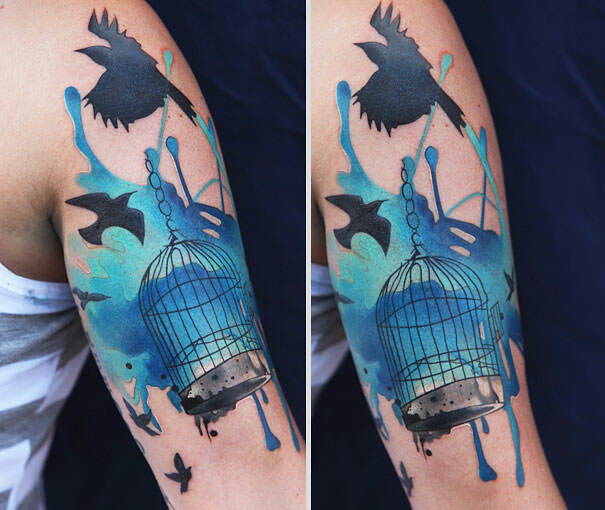 Simply put, all tattoos fade eventually - even solid black ones. 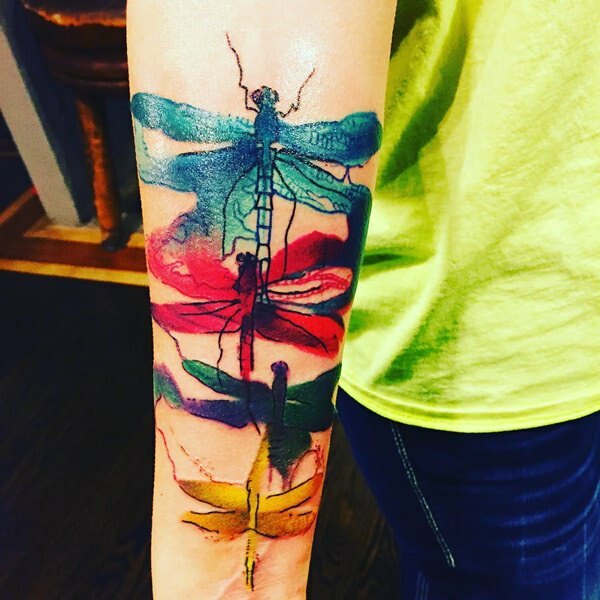 Whilst watercolor tattoos may fade slightly quicker; if the artist does a good job as mentioned above, it shouldn’t matter too much in the grand scheme of things as it should be easy enough to apply a touch-up to the well-thought out tattoo. 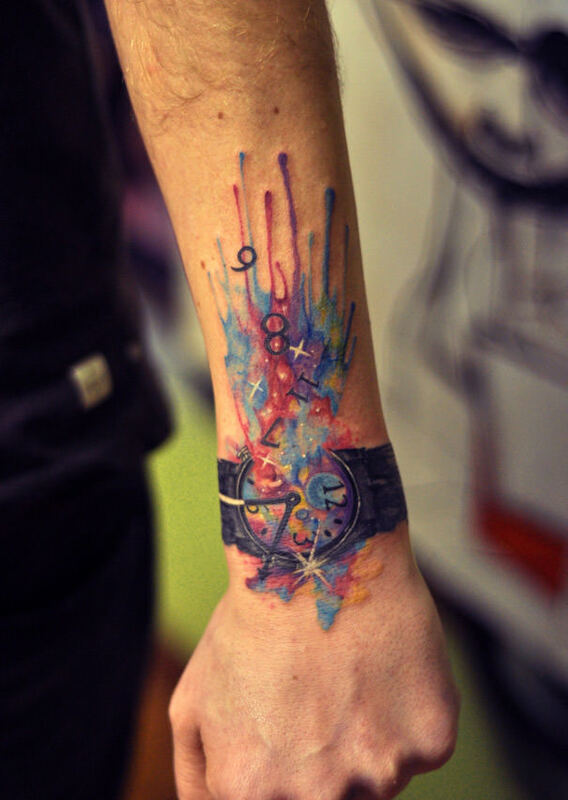 Oh, and we’re not talking in a matter of months here. 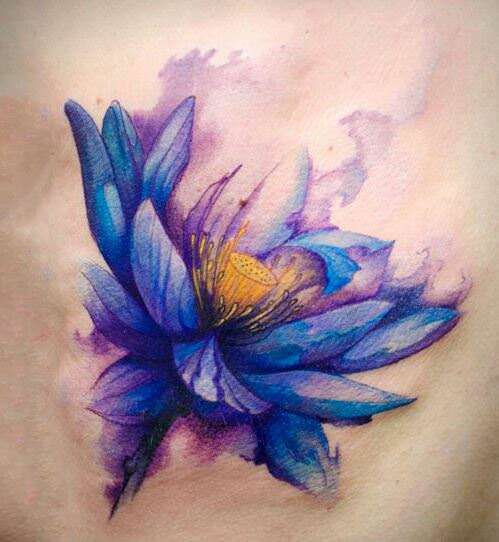 As long as your artist is an experienced professional, your watercolor tattoo should not really fade at all in the first several years as long as you look after it and don’t abuse it (which is covered in the section below). 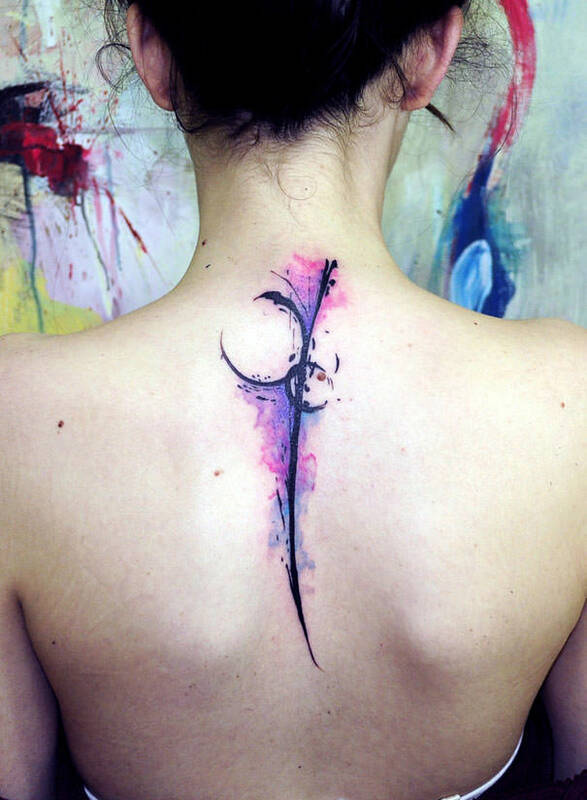 Several years down the line your tattoo will then likely begin to fade in a slow, gradual process - just like every other kind of tattoo (except maybe just a little bit quicker due to the lighter coloring). 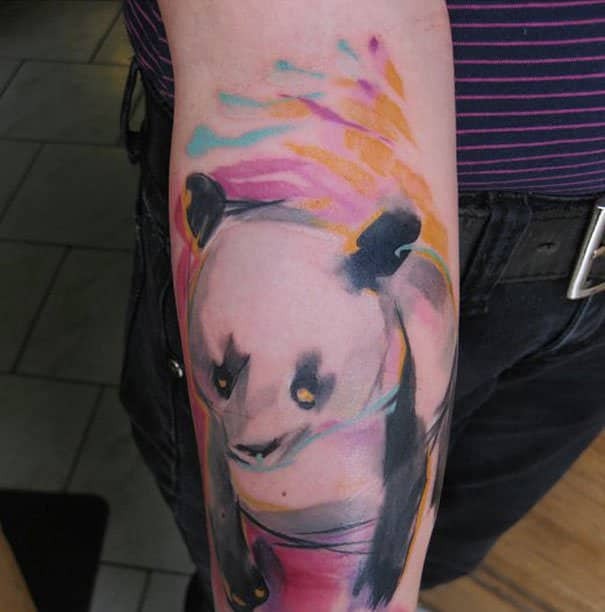 I’ve even spoken to artists who’ve had customers return 5 years after getting watercolor tattoos, and they still looked as colorful and vibrant as they did the day they got them - so keep in mind that getting some ink in a watercolor style is not always a tattooing death-wish waiting to happen a few years down the line. 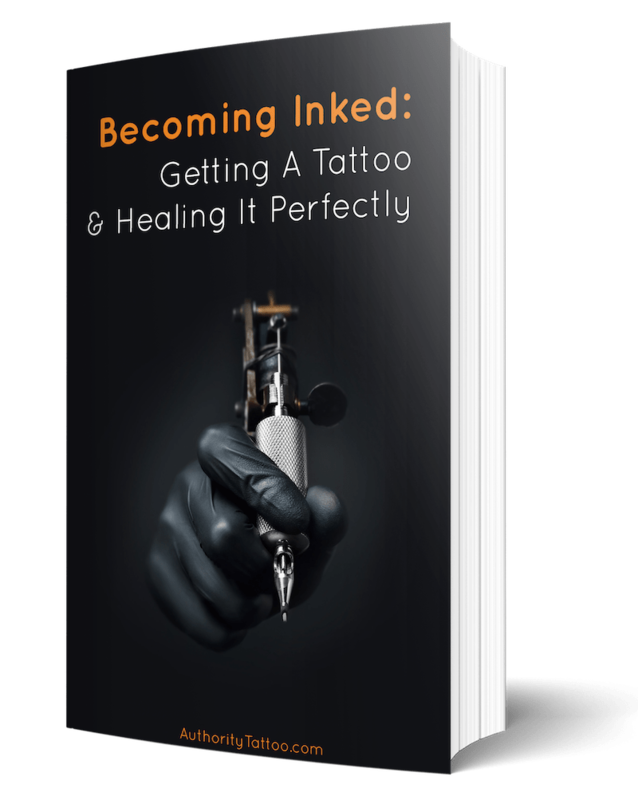 As with all tattoos, there are some things that you should definitely do (and not do) to ensure that your tattoo remains in as perfect condition as possible throughout its lifetime. 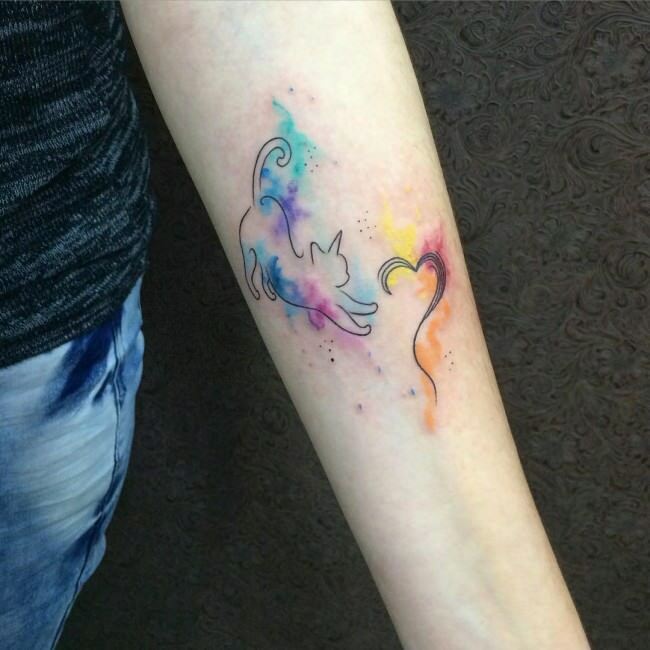 However, it is especially important with watercolor tattoos to ensure that you take good care of them due to the added delicacy of the lighter inks compared to more traditional tattoos. 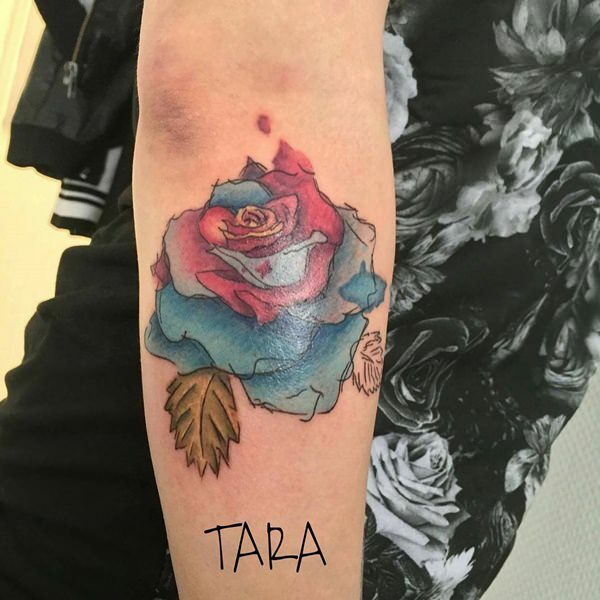 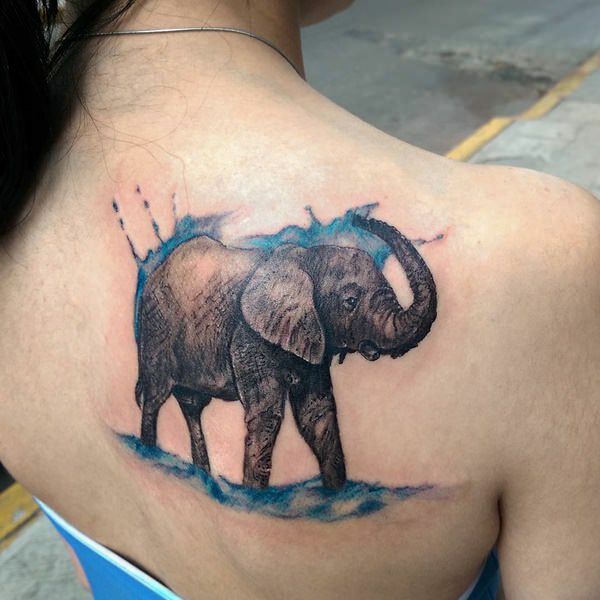 As already mentioned, in order to ensure that your tattoo looks as best as possible for as long as possible, you should definitely pick an artist who has plenty of experience with this tattooing style, and who knows all of the techniques required to ensure the tattoo ends up looking exactly how you want it to. 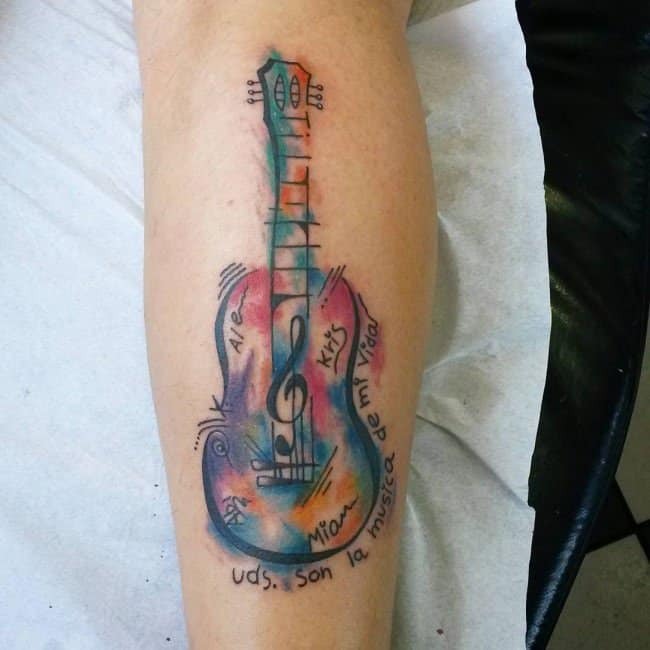 Don't just ﻿pick ﻿the cheapest artist! 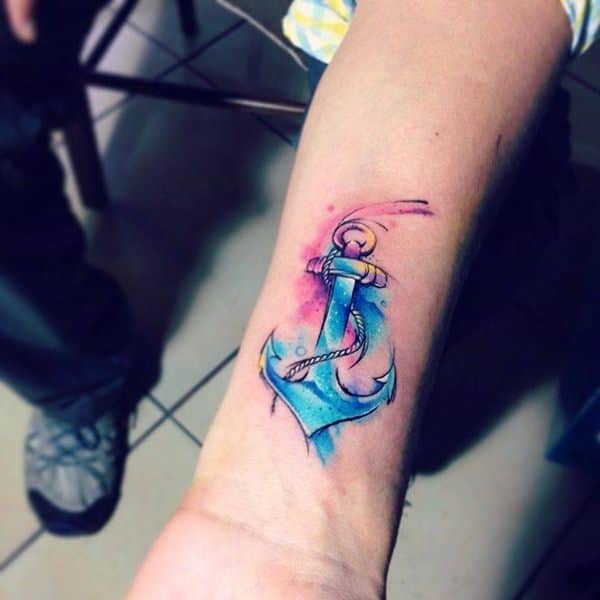 A less experienced artist could easily make a few wrong moves which could eventually lead to the tattoo fading much quicker than it would have done if it was in better hands when first created. 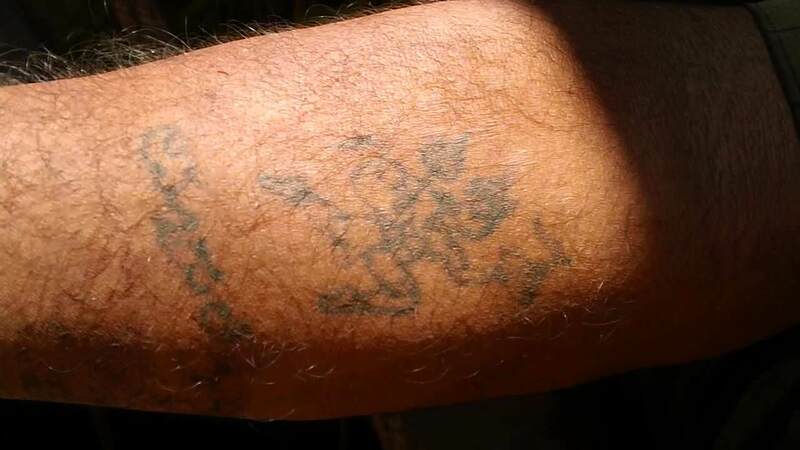 It doesn’t matter if your tattoo is old or new - the sun will always be its worst enemy. 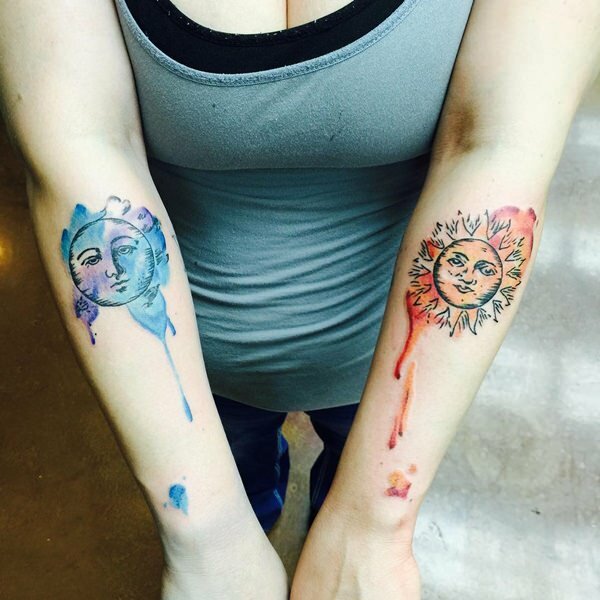 Constantly exposing your tattoo to direct sunlight will cause it to significantly fade over time, no matter what color or style it is done in. 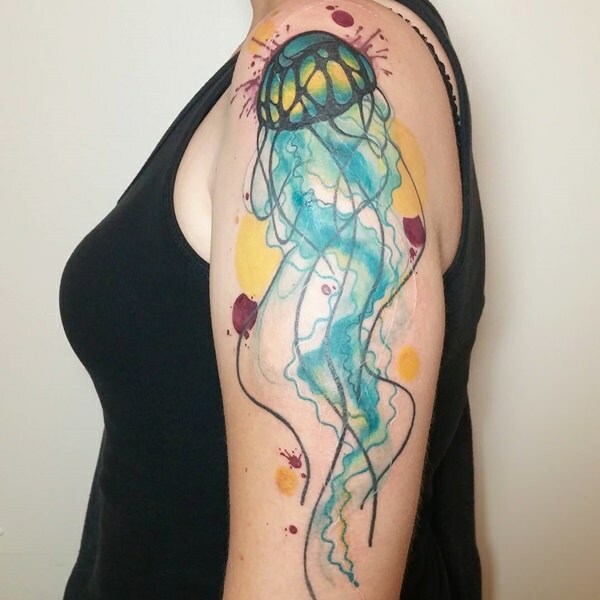 Therefore, as your watercolor is going to be a lot lighter than the majority of most other traditional tattoos, it is doubly important to ensure that you keep your ink out of direct sunlight as much as possible. 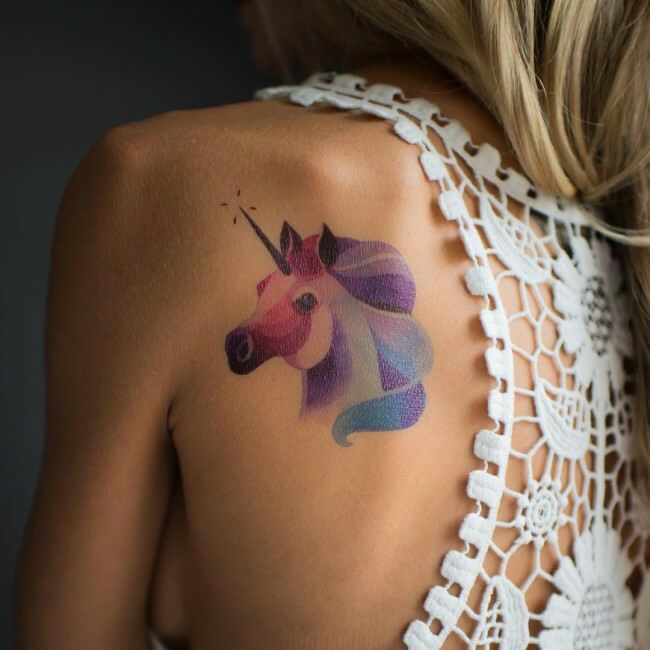 When you do need to flash your tat when out at the beach in the summer, make sure to use a high-strength sun lotion to block the most dangerous UV rays from zapping your tattoo. 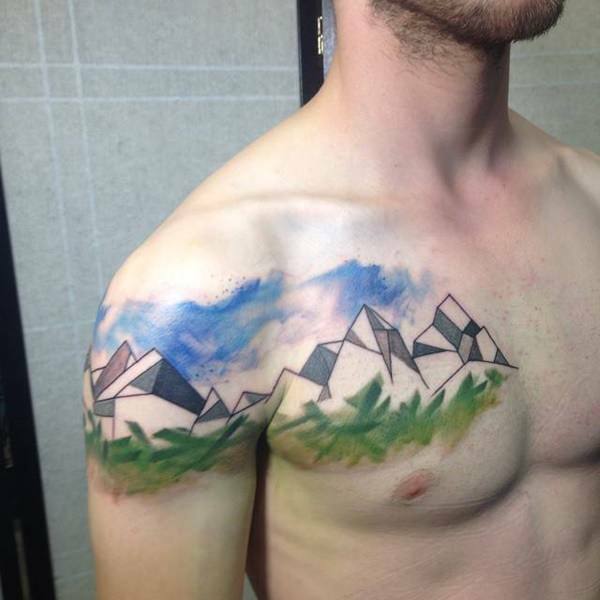 Before getting a new watercolor tattoo, you need to think very strategically about where you want it to go on your body. 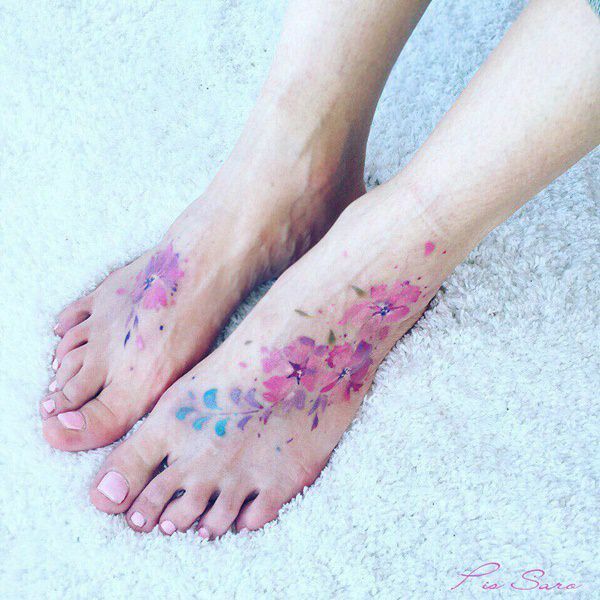 Any area of skin that is likely to be very prone to rubbing such as the tops of your feet and your buttocks should be a no-no when it comes to watercolor tattoos. 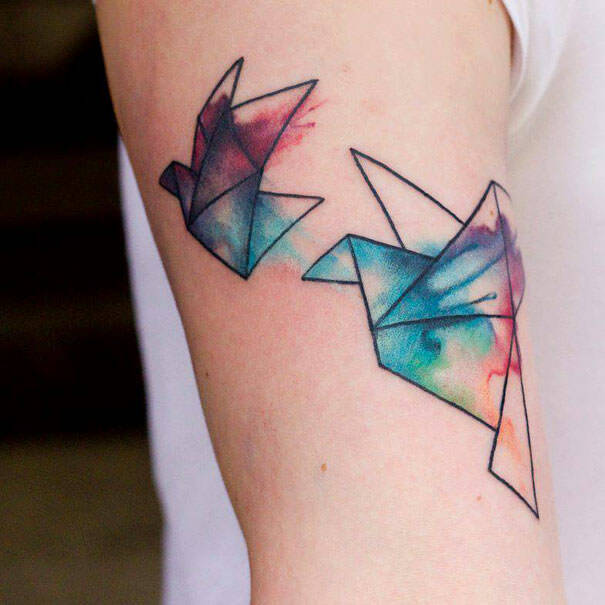 Constant rubbing on any tattoo will cause it to fade quicker than normal, so if you want to give your more delicate watercolor tattoo the best chance at standing the test of time then you should seriously think about putting it somewhere that isn’t going to be constantly coming into contact with anything. 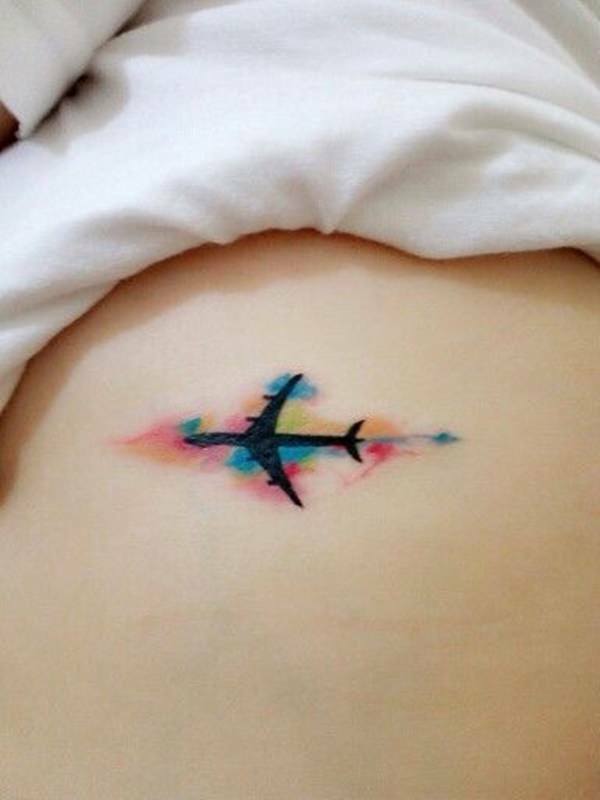 Your tattoo will only ever look as good as the skin it was created on. 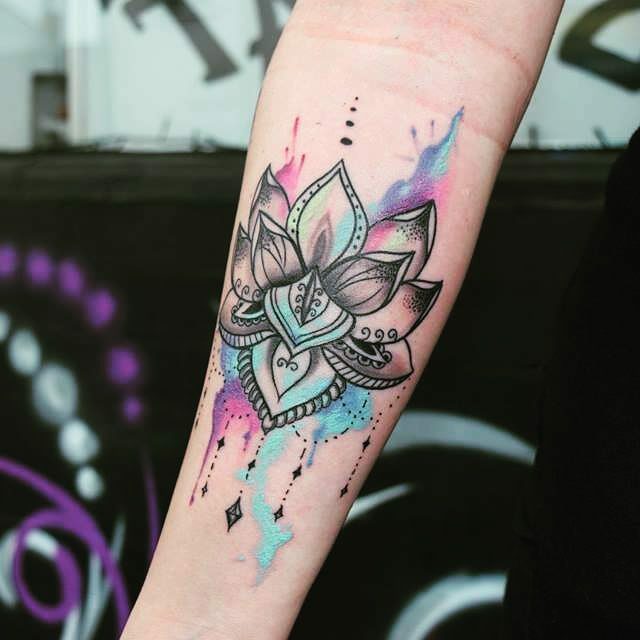 A healthy diet, adequate hydration and good quality sleep will all help to ensure that your tattoo stays looking fresh for as long as possible. 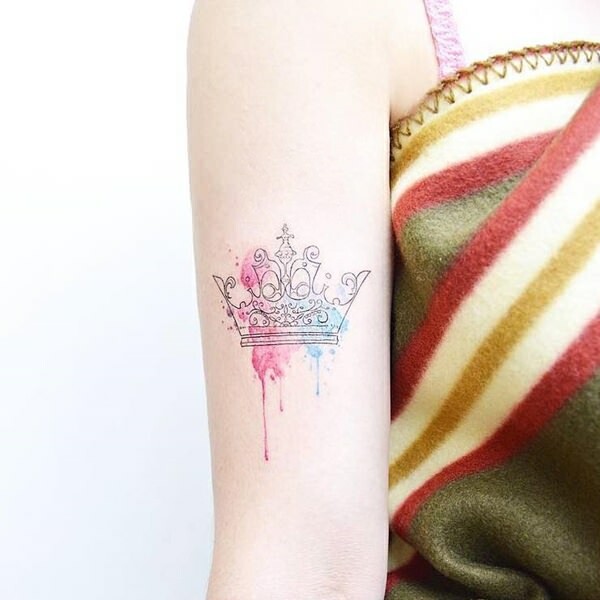 In order to keep your skin from sagging, wrinkling and drying out, a good hydrating moisturizer is essential. 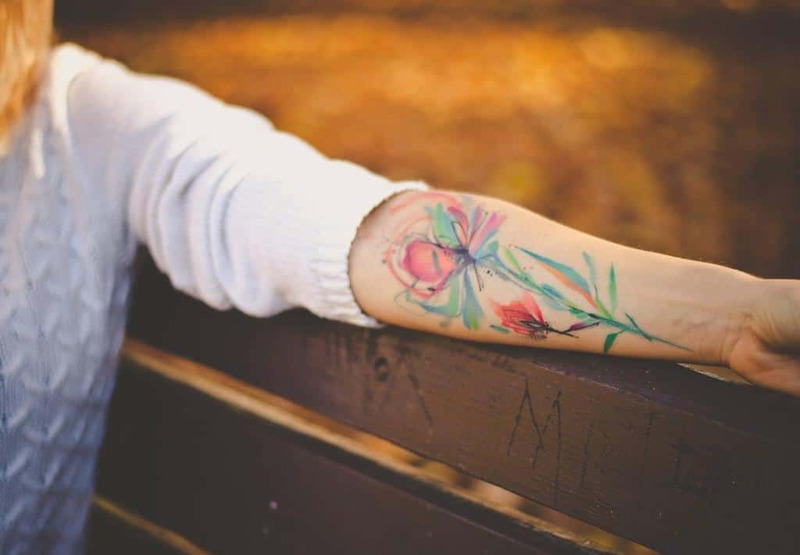 Ensure that you use a good quality, skin-sensitive and fragrance free moisturizer/tattoo lotion throu﻿﻿ghou﻿﻿t the healing process to give your skin/tattoo the best chance of recovering quickly and promptly. 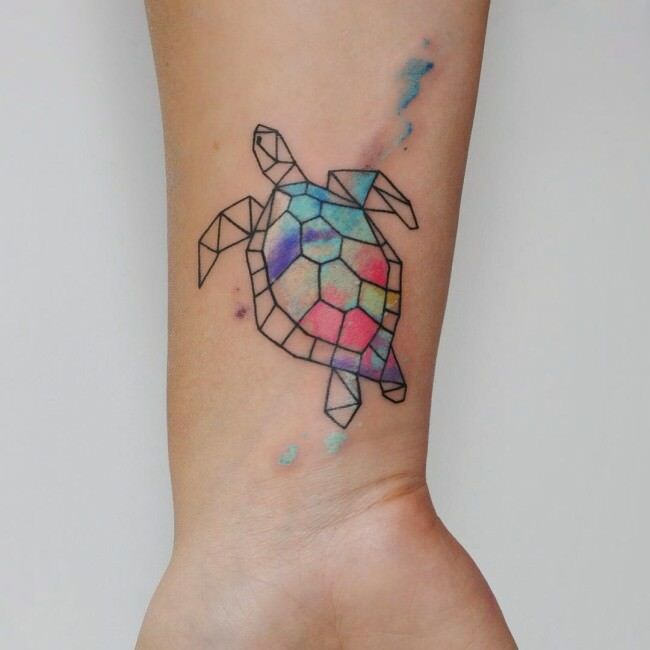 Continue to use a skin-hydrating moisturizer throughout the life of your tattoo to help prevent fading and to keep it looking bright and vibrant for as long as possible. 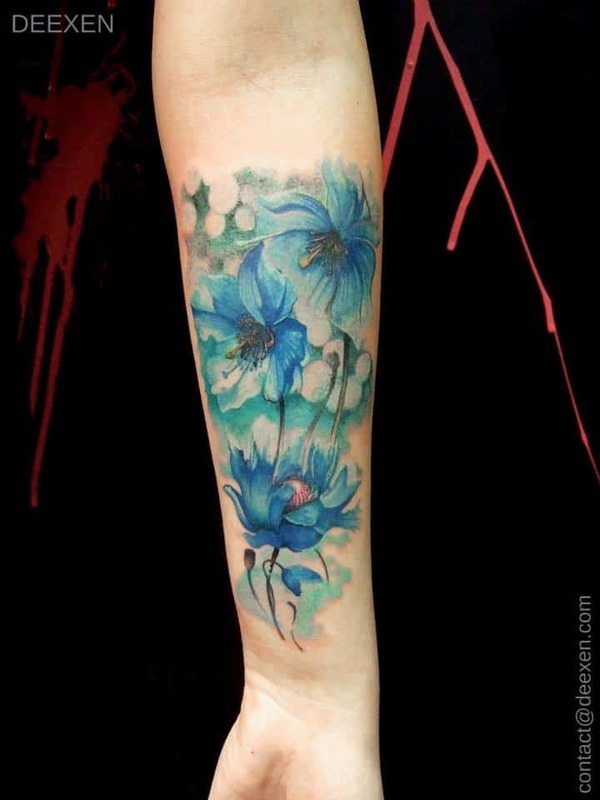 Yes - watercolor tattoos do generally fade faster than most traditional tattoos due to their lighter colors and lack of strong outlining - but this doesn’t mean that they’re going to fade into an unrecognizable mess a couple of years from now - especially if you pick a good artist and follow the tattoo care steps listed above. 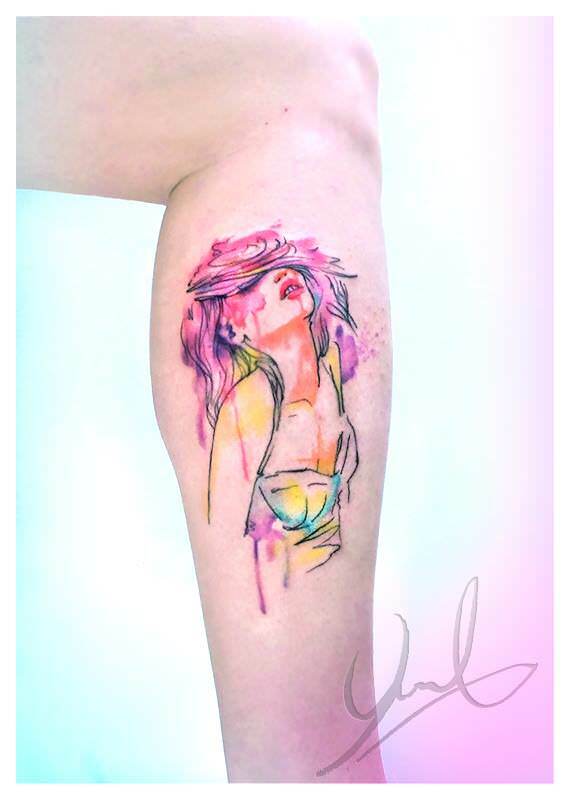 Watercolor tattoo fading in most cases is never as bad as many skeptics make out - so if you want a new watercolor tattoo, go and get it. 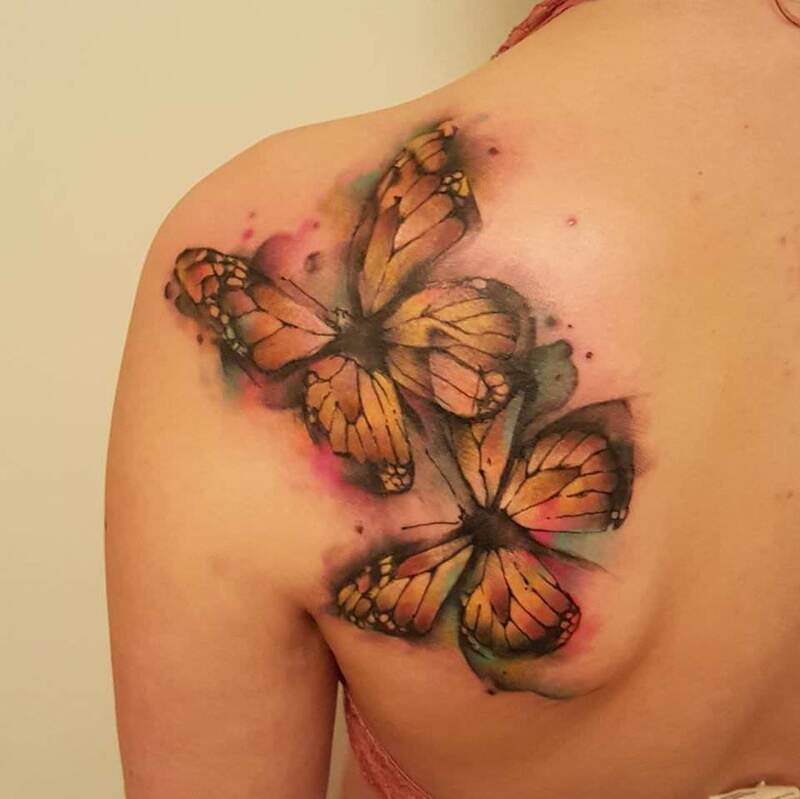 I’m sure it will continue to look beautiful for years to come. 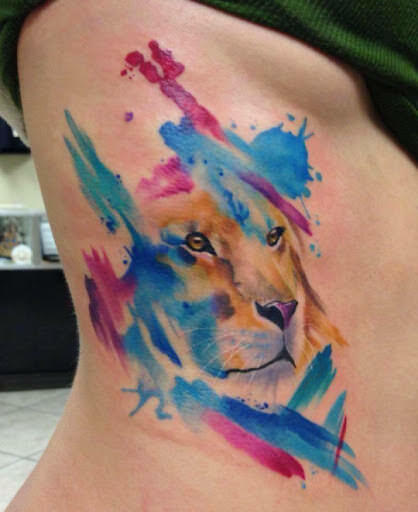 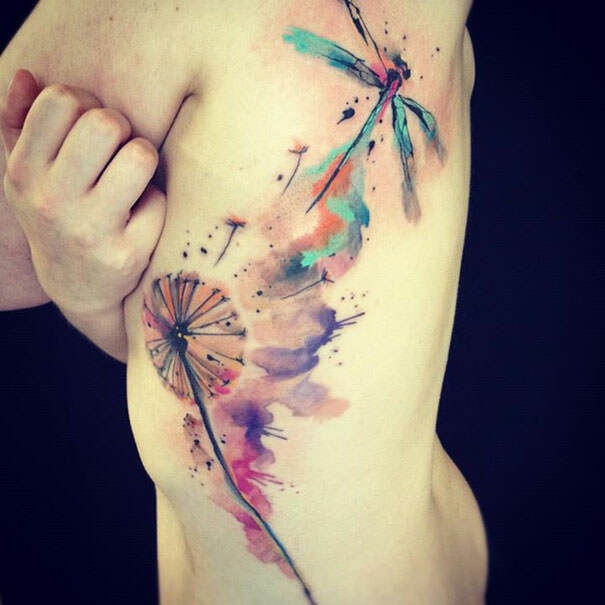 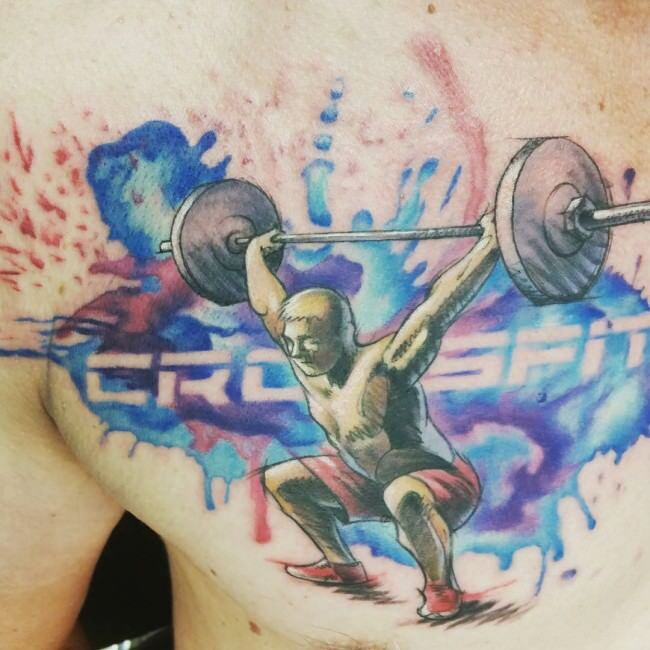 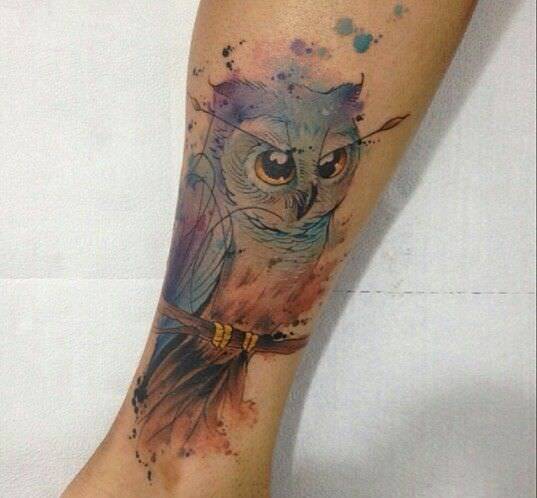 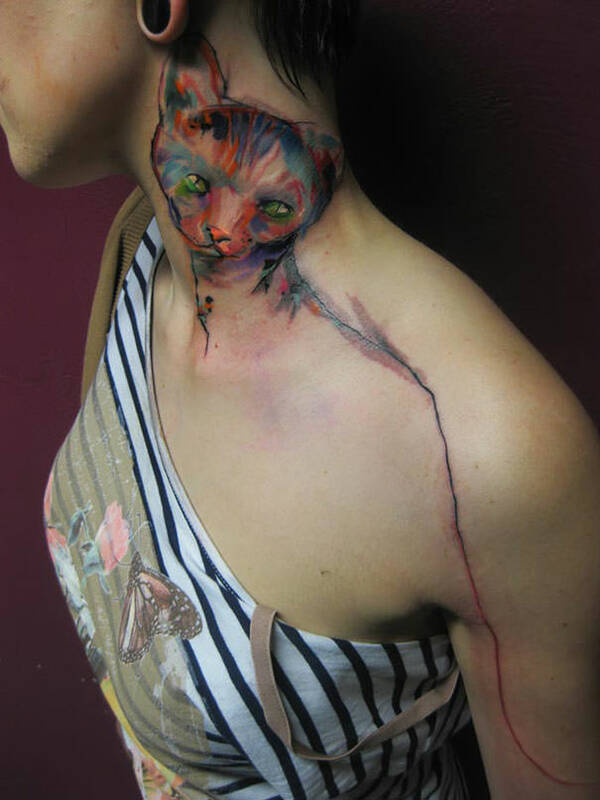 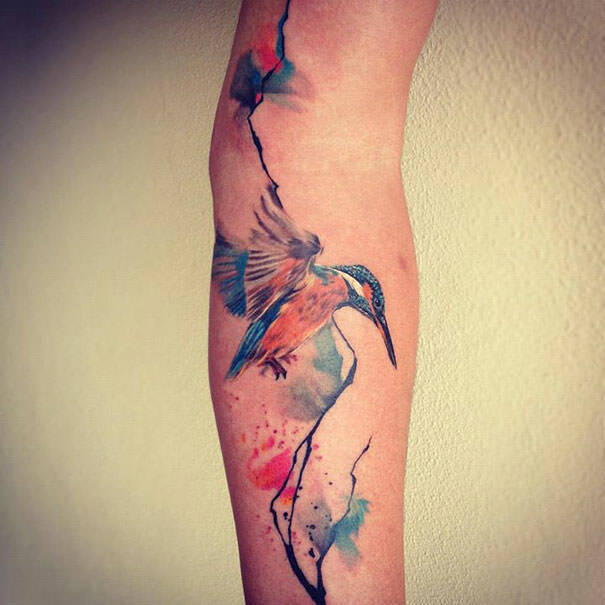 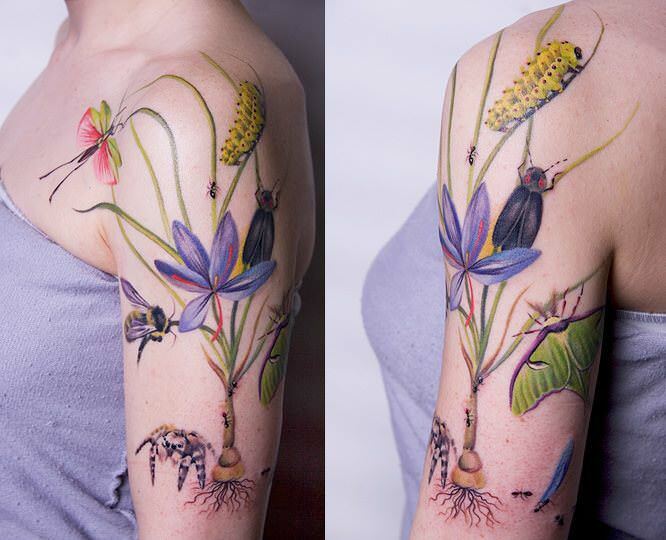 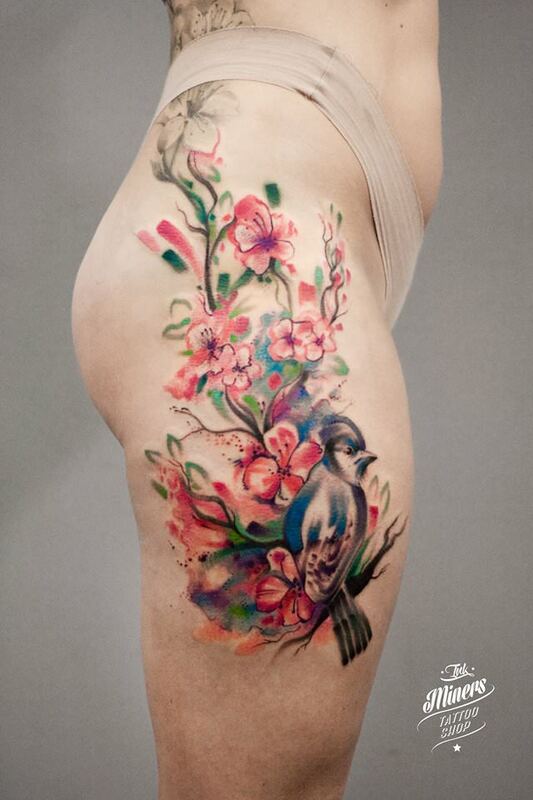 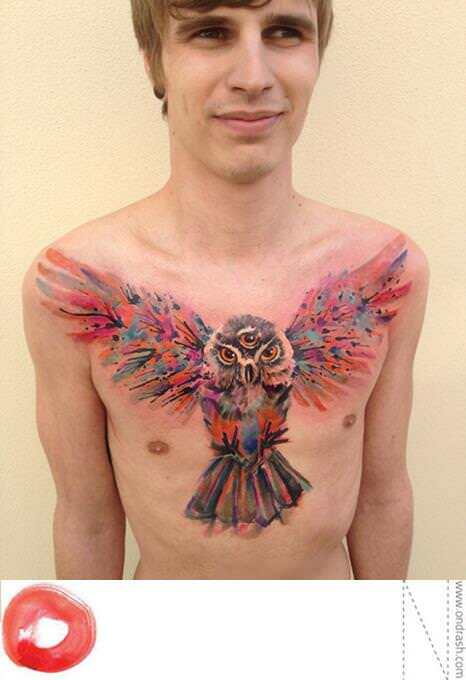 What would a watercolor tattoo article be if it didn't show off some of the beautiful art ever created in this style? 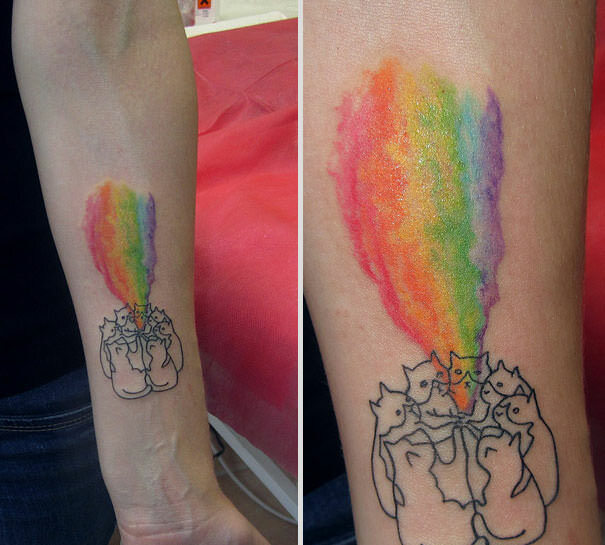 A huddle of cats creating some sort of watercolor magic - why not!? 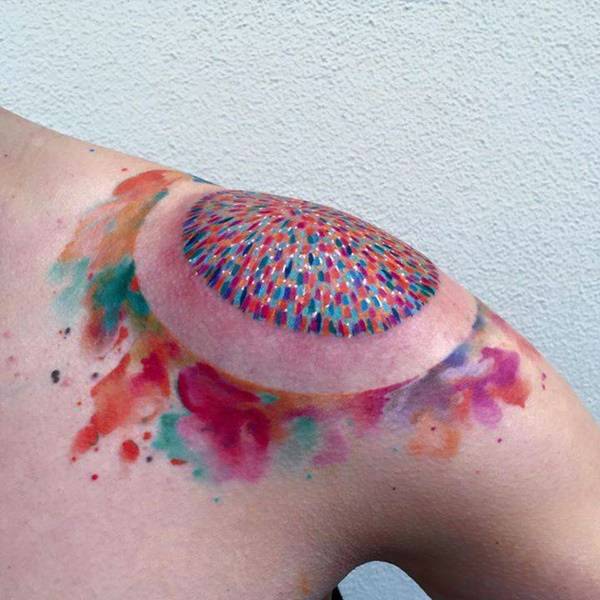 I don't really know what this tattoo is of but it still looks pretty darn cool! 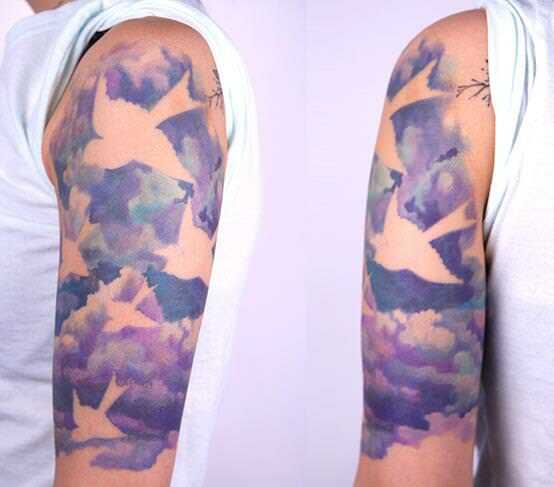 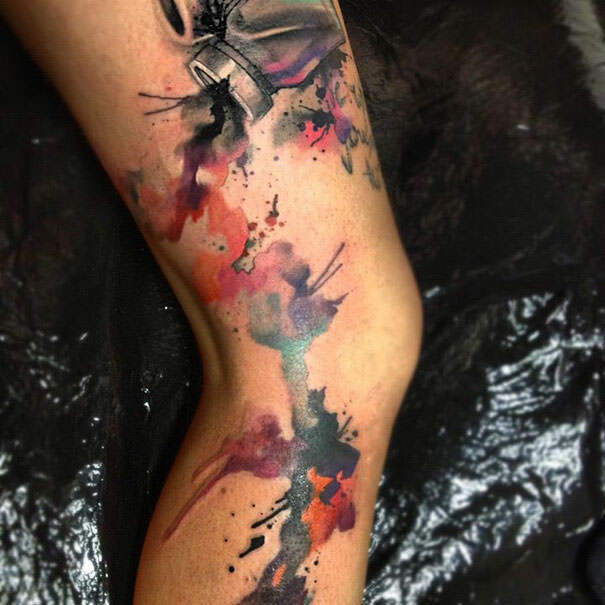 watercolor paint splatter tattoos have become very popular in recent years. 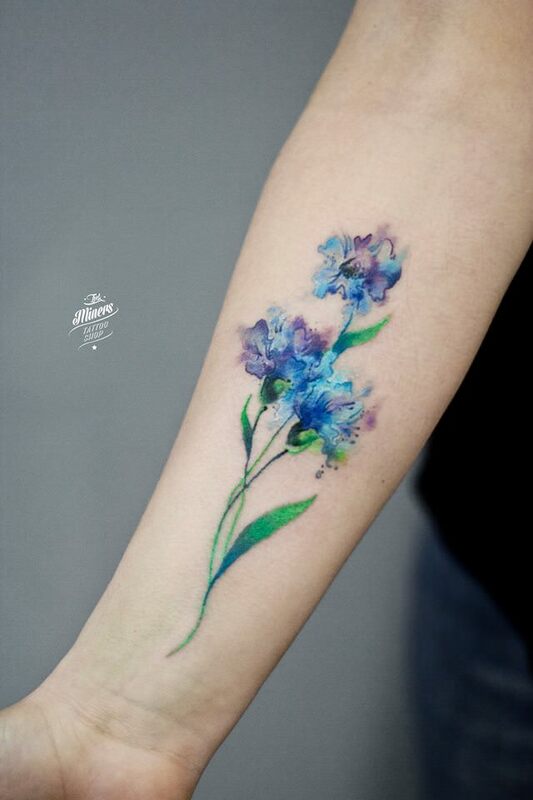 Be aware though that the colors can fade quite quickly on these types of tattoos if the artist doesn't take enough care or isn't experienced enough.